The Ten Questions People Most Frequently Ask Bone… The Interview! Bone has been in many tough situations in his life; he can handle tough questions. Here he rests on top of a saguaro cactus in Arizona looking for border control agents. His lack of official papers, or even a birth certificate, can cause problems at times. Q: Do you really talk? We’re speaking ethics here, Bone. Blogging is about transparency. That means honesty. A. Are you crazy? Have you ever heard a bone talk? Of course I don’t talk. I just think out loud. Q: Curt sometimes refers to you as he. Does this mean you are a male bone? “Just cut a small chip off of it!” Outrageous! I am not some it to have chips cut out of. Besides, I lead a rich fantasy life and have no desire to know whether I am male or female. Call me she, he, or Bone, but never it. Q: You have travelled all over the world and met thousands of people. How do they usually react to you? A. With befuddlement. You should have seen the look on the face of the customs agent in New Zealand who tried to seize me as ‘animal matter.’ But emotions run the gamut. There was a Japanese man who got off a tour bus at Yellowstone National Park and wanted to hold me for good luck. Soon there were 40 other Japanese handing me around, oohing, and taking photos. I was thrilled. On the opposite side, I know a woman who refuses to touch me, like I have cooties. “I don’t know where Bone has been,” she states primly. Not surprisingly, there is also jealousy. “I want to be you and travel the world,” a good friend in Sacramento told me. A. Visit graveyards; there are lots of old bones there. My favorite grave is Smokey Bear’s in Capitan, New Mexico. I once stood on his tombstone for ten minutes trying to communicate but all I could get was something about ‘growling and a prowling and a sniffing the air.’ A close second is the grave of Calamity Jane in Deadwood, South Dakota. What a woman! These are difficult choices, though, when you toss in the likes of Hemingway, Daniel Boone and Billy the Kid. On the light side I once visited Ben and Jerry’s graveyard of discarded ice cream flavors in Vermont. My spookiest experience was a visit to the Capela dos Ossos, the Chapel of Bones, in Evora, Portugal. Those folks definitely have a skeleton in their closet, lots of them. Bone has a special fondness for unusual graves. Here he hangs out with Billy the Kid in New Mexico. Has he been in a shoot out? Is that blood on his vest? Q: So, what’s your second most favorite? A. Too hard; I am a dilettante dabbler, but here are a few. Wandering, of course, anywhere and everywhere and by all modes: bikes, kayaks, rafts, skis, backpacks, sailboats, planes, helicopters, trains, cars, RVs, etc. Visiting wild, remote and beautiful natural areas. I started life wandering the Sierra Nevada Mountains, John Muir’s Range of Light. Seeking out the strange such as ghosts and aliens (I’ve been to Roswell four times). 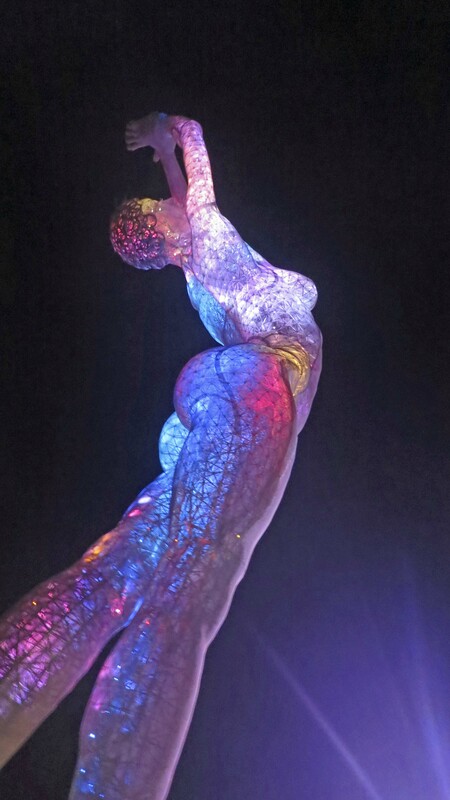 Attending unique events like Burning Man but I also have a fondness for any type of fair. Meeting weird people like Tom. Bone backpacking on the John Muir Trail. Tom being eaten by a bony desert monster. Q: Speaking of Tom, he and Curt ‘discovered’ you in 1977 and you have wandered extensively with both. Which do you like best? “I was in deep trouble in Tombstone. Wyatt Earp had arrested me for robbing a bank and Doc Holiday was checking me for weapons. My life as Bone was in serious jeopardy. Odds were I was going to end up on Boothill, along with Billy Clanton. But then the ever brave Eeyore came to my rescue! I hopped on his back and we went riding off into the sunset while leaping over large rocks. Q: Which of your journeys has been most memorable? A. I would have to say traveling the length of Africa in the back of a truck from the Sahara Desert in the north to Cape Town in the south. Almost falling off the back of a riverboat into a piranha infested section of the Amazon River would have to be a close second. I was perched on the back railing doing a photo shoot. And then, of course, there was the 10,000-mile bike trip. 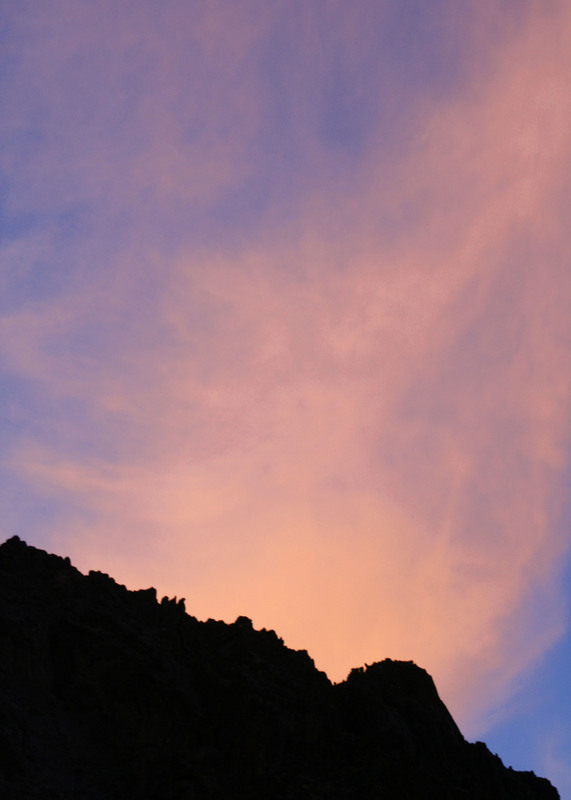 Q: You are often seen scrambling over rocks in remote sections of the Southwestern United States. What’s that all about? A. I’ve developed a fondness for Native American Rock art. 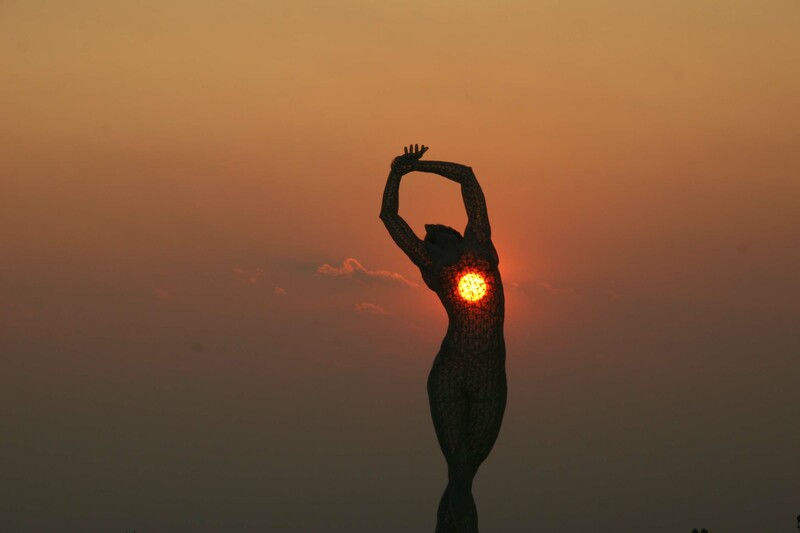 It resonates with my bone-like nature. It’s also another excuse to go wandering around in the outdoors. Plus, some those places might be haunted and it is a great place to look for UFOs. Some of the petroglyphs look amazingly like aliens. Finally, wandering in the desert is known to be good for the soul. Ask the Prophets of yore. How can this guy and his strange dog not be aliens? Here I am making tracks across White Sands National Monument in New Mexico. It’s a great place to watch out for UFOs. Q: Ah, being a born-again bone, do you have any insights into the great unknown? Q: Finally, and this may be a little sensitive, but do you always run around naked? A. What kind of a question is that? Do you think I am uncivilized? For shame. I am the epitome of haute couture! A bow and arrow toting, card-carrying NRA member in Montana has designed and made me two leather vests. What’s more, an 80 plus year old woman in Kansas going on 20 with a crush on Johnny Depp and a room devoted to the Egyptian gods has made me a kilt and several other outfits. Then there is the horse woman actress in Ohio whose husband is an ex-secret service agent who has promised me an outfit and the artist head of a PR firm in the Bahamas who has promised me another. Face it; I am hot stuff, clothed or naked. I may take up a modeling career. So… now you have heard from Bone, do you have any questions you would like to ask him? He promises to answer. 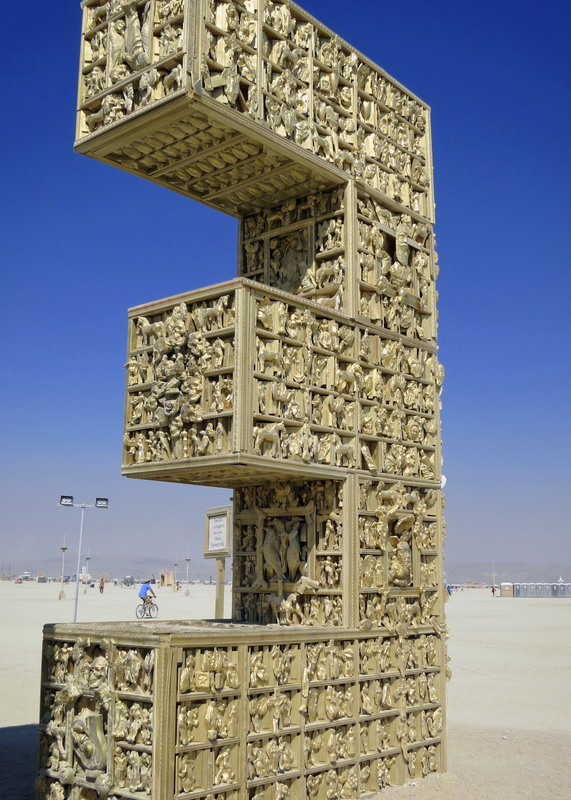 Friday: The stunning temples of Burning Man. Monday: Bandon by the Sea. It’s back to the Oregon Coast. Black Bears are much smaller than either brown or grizzly bears, but this doesn’t mean they aren’t scary. This one was cruising our neighborhood in Oregon and tipped over the heavy Webber Grill on our porch. Our daughter, Tasha, was sleeping in the bedroom next to the grill. “Curtis!” she screamed. 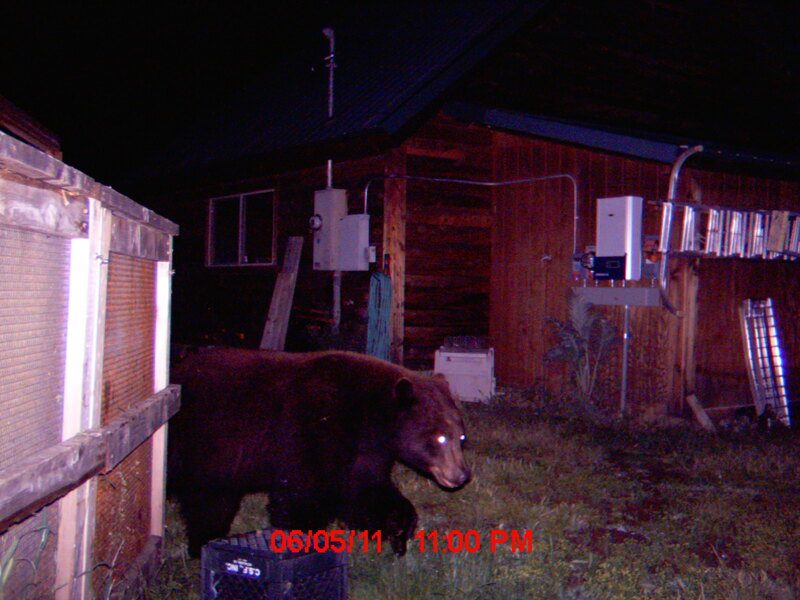 Later, our neighbor captured the bear’s photo on a surveillance camera. I’ve been re-blogging older posts while my laptop is at the doctors with memory problems. Today it’s time for another Sierra Trek Tale. Next week, I’ll get back to the first Sierra Trek but today we are jumping ahead five years to the first trek I led into the back country of Yosemite where bears rule. Bears like me, or at least they haven’t eaten me. They’ve had numerous opportunities over the years. 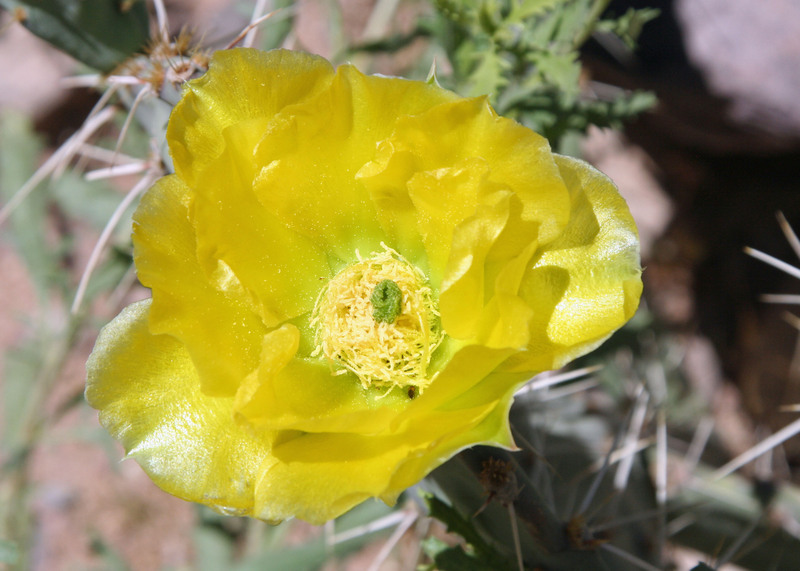 It goes with the territory of backpacking throughout North America for over four decades. My scariest encounters, as it turns out, were also my first. My friends Ken Lake and Tom Lovering joined me on the first three days from the Yosemite Valley floor to Tuolumne Meadows. Day one found us climbing several thousand feet out of the Valley and camping above the Little Yosemite Valley. The bears dropped by for a visit on our first night in the Park. Half Dome, Yosemite. Little Yosemite Valley is on the other side. After carefully hanging our food bags from a cable provided by the park service and burying the left over fake freeze-dried raspberry cobbler (it was made from apples), we trundled ourselves off to our sleeping bags. The problem was we buried the food a little too close to Lake. I think Tom may have been up to his usual mischief. The next morning, a very excited Ken asked if we had seen the bears in our camp the previous night. Neither of us had and we attributed his sighting to an overactive imagination. Believe me, if a bear had been digging up food next to my head, my two companions would have known about it, immediately. Day two was tough. What I hadn’t counted on was the amount of snow still left on the ground. We spent most of out time slipping, sliding and slogging through it. By three in the afternoon, Tom was ready to set up camp right in the middle of a snowfield. Ken and I threatened to leave him with the bears and he committed to another hour. Fortunately, that night was bear free. They would have found little resistance from the three of us. Eventually, we made it into Tuolumne Meadows where I was faced with another challenge: hiking over 70 miles of snow-covered trails by myself while Ken and Tom returned to Sacramento and work. The journey was fraught with opportunities for breaking a leg, or losing the trail, or being washed away when crossing streams raging with water from melting snow. None of the above was a desirable outcome for someone hiking alone. Tuolumne Meadows in the summer. My other option was to return to Sacramento with Ken and Tom, which was not acceptable. I had a week off to wander in the woods and I was going to wander in the woods for a week. I compromised by heading back over the mountains toward Yosemite Valley. 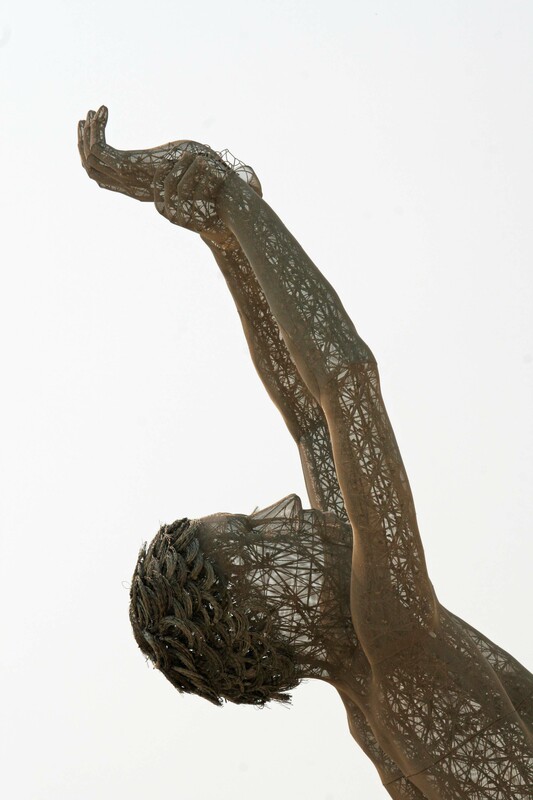 My fractured logic concluded that it was better to break a leg and get lost where I had been than where I was going. I also promised myself to be really careful. This included keeping my food from bears. Hiking out of Tuolumne Meadows took me back around Cathedral Peaks shown here. The first day was non eventful and the second idyllic. I was exploring new country, doing what I most love to do. As evening approached, I found a delightful campsite on the Cathedral Fork of Echo Creek. Amenities included a babbling brook to put me to sleep, a flat space for my sleeping bag and a great food-hanging tree with the perfectly placed limb. A hot dinner topped off by tea spiced up with a shot of 151-proof rum and I was ready for sleep. I carefully hung my food bags at the recommended 12 feet off the ground and 9 feet away from the tree trunk and then snuggled down in my sleeping bag. As was my habit at the time, I slept out in the open, only using my tent when rain threatened. It was somewhere around 4 am and very dark when I awoke with a pressure on my chest. I couldn’t see very far but I didn’t have to. Approximately five inches away from my face was a long black snout sniffing at me. It was filled with grinning teeth and topped off by a pair of beady eyes that were staring at me with a hungry look. I let out a blood-curdling scream and vacated the premises. As I flew in one direction, the equally surprised young bear that had been standing on me flew in the other. I don’t even remember getting out of the bag. The next thing I knew I was standing up, yelling and shining my flashlight into the woods where not one, but two pairs of orange eyes were staring back at me. I lost it. Never have so many rocks been hurled with so much vigor in such a short period of time. The bears wisely decided to head off over the mountain. But the damage was already done. My camp was a disaster area. My carefully hung food was scattered all over the ground with literally every meal torn open and sampled. All I had left was a chunk of cheese and it had one large bear bite out of it. I hid the cheese under a heavy rock. As a further insult, one of the bears had chomped down on my plastic rum bottle and all of the rum was gone. I couldn’t even drink. With that option eliminated, I policed the area, crawled back in my bag and went back to sleep. When I awoke in the morning it was obvious that the bears had come back into camp to clean up anything they had missed. Once again the previous night’s trash decorated my campsite. At least the bears let me sleep this time. And they had missed my cheese. 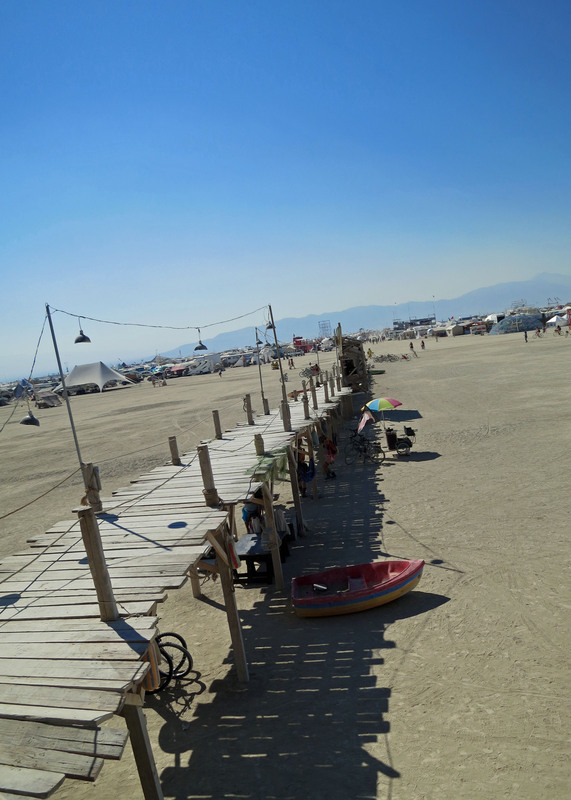 NEXT BLOG: A return to my photo series on Burning Man. Even the birds are sound asleep. Tom argues it’s six AM, not the five my watch is showing. “Arizona does not honor Daylight Savings Time,” he primly informs us. He’s right. Adjusting my watch adjusts my attitude… a little. Adding injury to insult, something akin to Folgers has been sewn up in burlap, thrown in boiling water, and called coffee. Oh well, it’s a hot, it’s brown, and we have a beautiful day of floating down the Colorado through the Grand Canyon ahead. Tom is our boatman of the day. He checks to make sure our toenails are painted and then lets us board. The wind is still blowing but it has lost its ferocious bite. A mile down the river we pass Ten Mile Rock, a prominent landmark that has fallen from the cliffs above and now juts up out of the river. 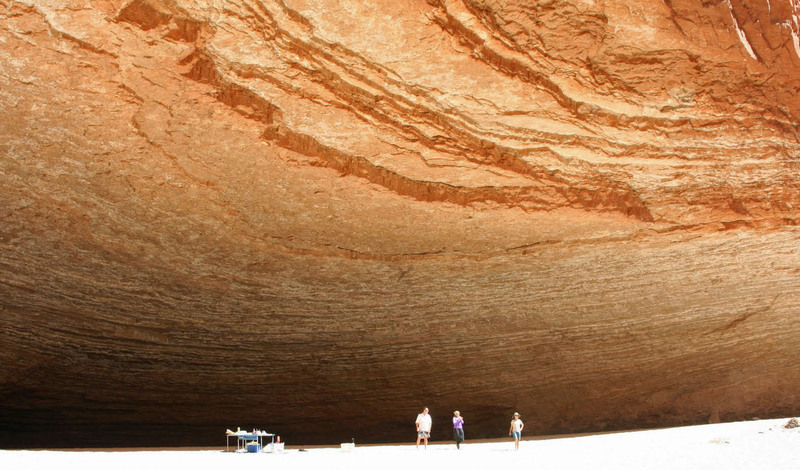 Made of Toroweap Sandstone, it was laid down in shallow seas that covered the area some 250 million years ago. 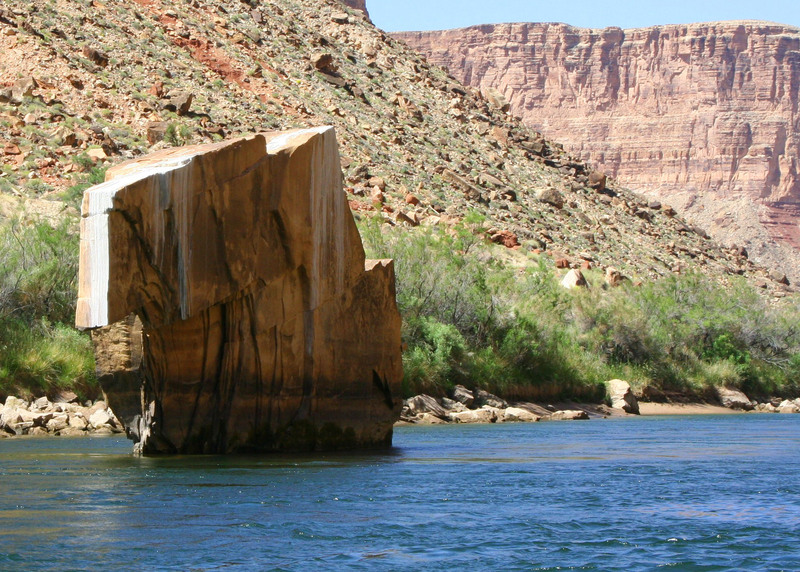 Ten Mile Rock on the Colorado River. I thought it should have a more impressive name. 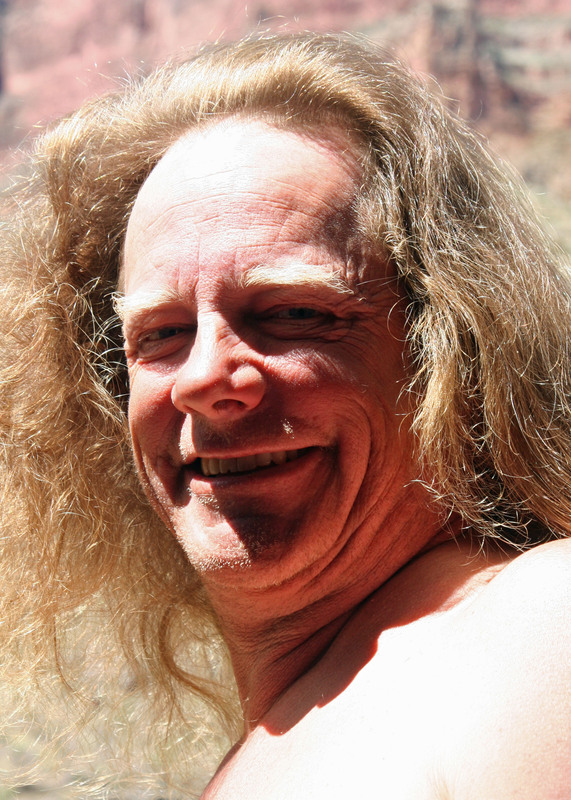 “I love rowing,” Tom tells us– and it is obvious he does. 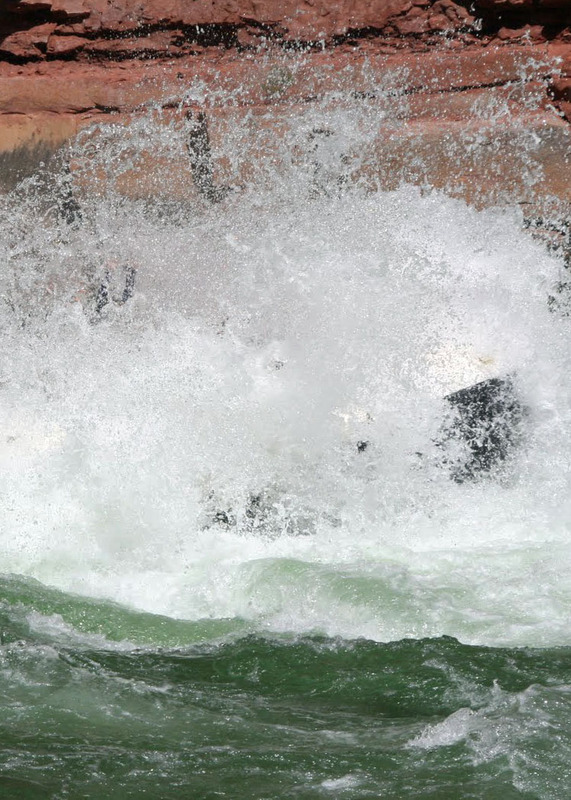 It is more than the heart-stopping, adrenaline-pumping moments of major rapids where the boatman’s knowledge and skill is matched against the tremendous power of the river with its dangerous rocks and grasping holes. 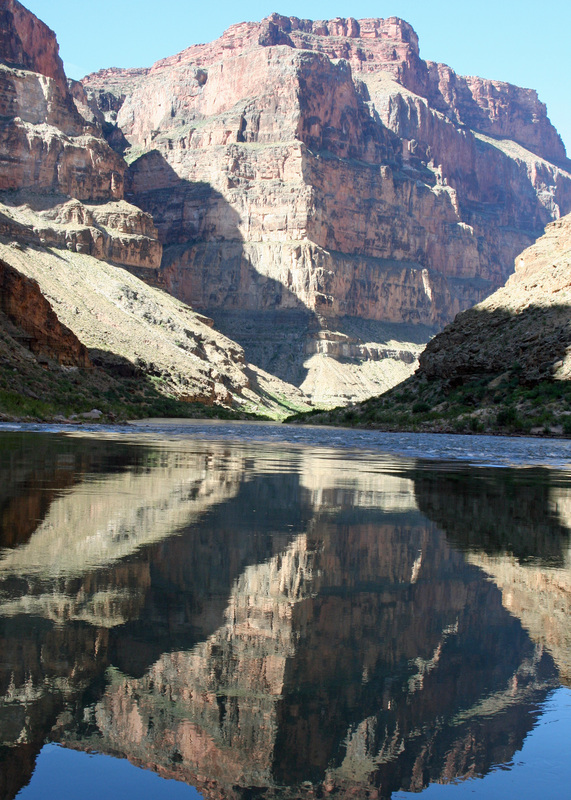 And it is more than the opportunity to enjoy incredible beauty of the Grand Canyon that rowing provides. Tom enjoys the rhythm and the hard work. He even liked the backbreaking challenge of rowing against the wind. House Rock Rapid demonstrates one of the more serious. The river is at its low point. More rocks are exposed and a massive hole lurks downstream from the largest rock. Even the most skilled boatman will be challenged to avoid it. 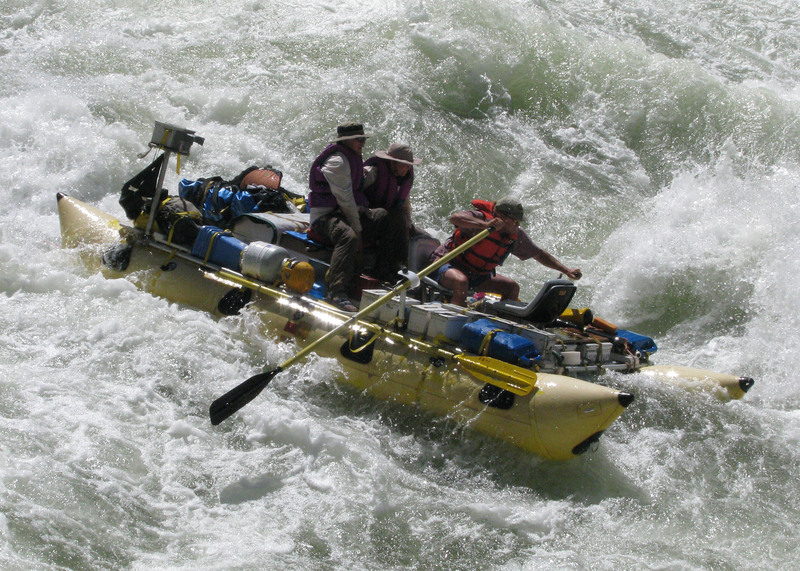 We all land and climb off our boats to scout the rapid. Tom is eager to move on. Steve is adamant about waiting for more water. After a long discussion between the boatmen, a decision is made to take the more cautious approach. Tom’s fist bonks me on the head when we are halfway through. One of his oars has popped out. I look left and all I can see is churning, raft-eating water. We are poised on the edge of the hole… about to be sucked in. Tom becomes a virtuoso of one-armed madness. Ever so slowly, like about a thousand years, the boat decides to go where he wants. We land, and for one of the few times in his life, my ever-talkative friend is silent. We looked to the left and saw we were poised on the edge of a massive hole. The next day, Megan Stalheim, Dave’s niece, is our boat woman. 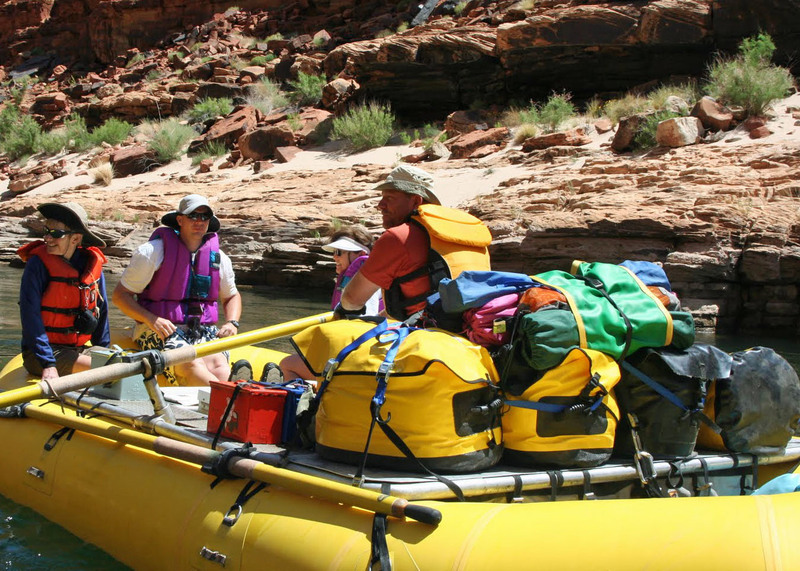 This is Megan’s first time rowing a raft and her first time rowing through the Grand Canyon. It would seem insane except Megan is a world-class kayaker. She is an expert at reading water. The problem is that our large, fully loaded rafts do not move like feather light kayaks… picture driving an 18-wheel Mack Truck with a Ferrari 458 attitude. We have some adventures. Megan keeps the messy side up, however, as rafters say. (The non-messy side is the smooth bottom of the raft.) So it’s all good. Megan, like me, has served as a Peace Corps Volunteer in West Africa. When she gets off the river she is heading for Tanzania where she will work with a women’s craft co-op. Beyond our “kayaking” experience with Megan, the big news on day three is that we began our side-trips. Almost all journeys down the Canyon include stopping off to see the sights. Some are quite beautiful and others provide unique challenges, as if our daily challenges of negotiating rapids aren’t enough. 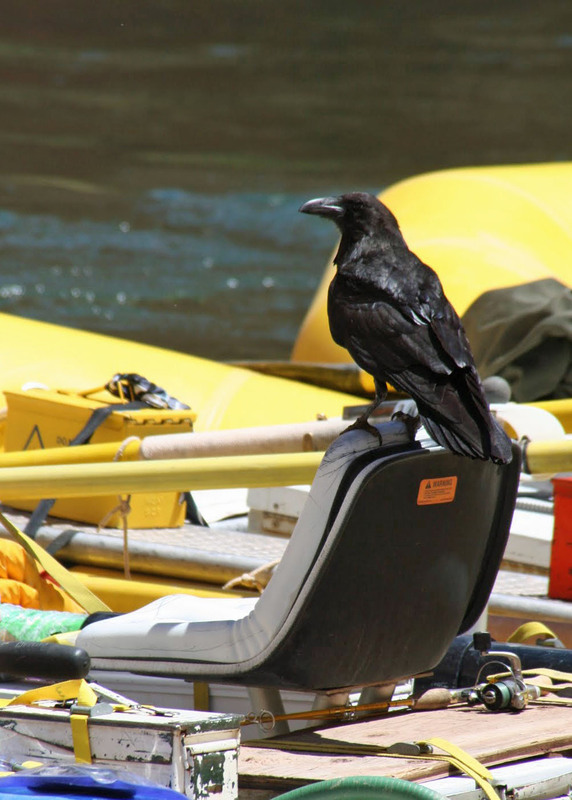 A raven stopped by to visit and checked out the “Captain’s Chair” on Steve Van Dore’s boat. These large birds are one of the primary reasons food needs to be carefully stowed. I didn’t get a photo of our group members leaping but this is what they leapt off of into the muddy water below. Water was splashed on the rock slide from a pool behind the lip to make the slide more smooth. Or so they said. Next we stopped off at Paradise, as in Vasey’s Paradise. 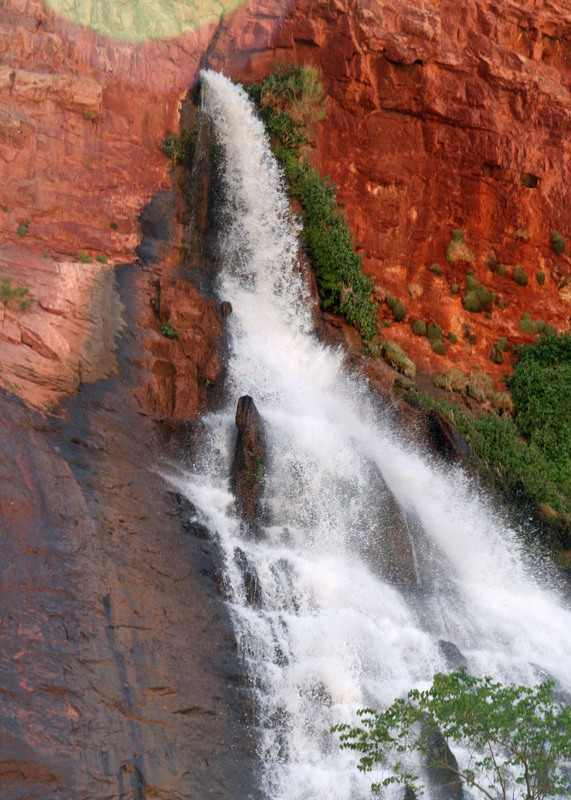 A beautiful waterfall shoots out of a Redwall cliff and creates a Garden of Eden at it base. It is worthy of the name. The waterfall shooting out of the Red Wall at Vasey’s Paradise, Mile 32. 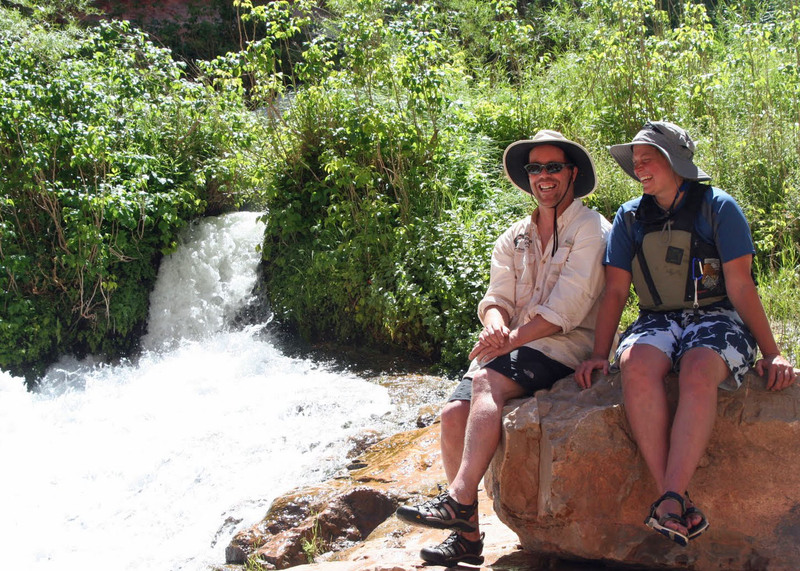 Dave Stalheim and his niece Megan perched on a rock at Vasey’s Paradise in the Grand Canyon. 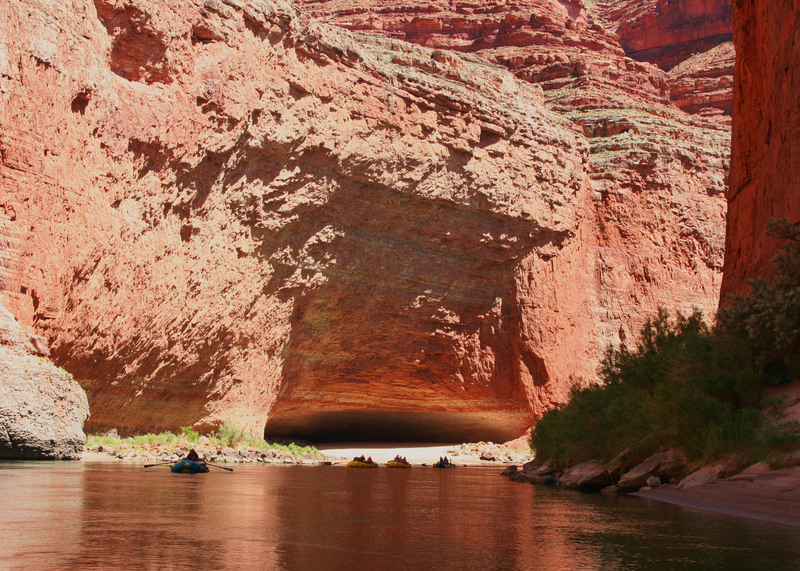 A view of the Grand Canyon looking upriver from the Redwall Cavern. In my next post we visit an ancient Anasazi storage facility high on the cliffs above the river and play in the beautiful Little Colorado River. 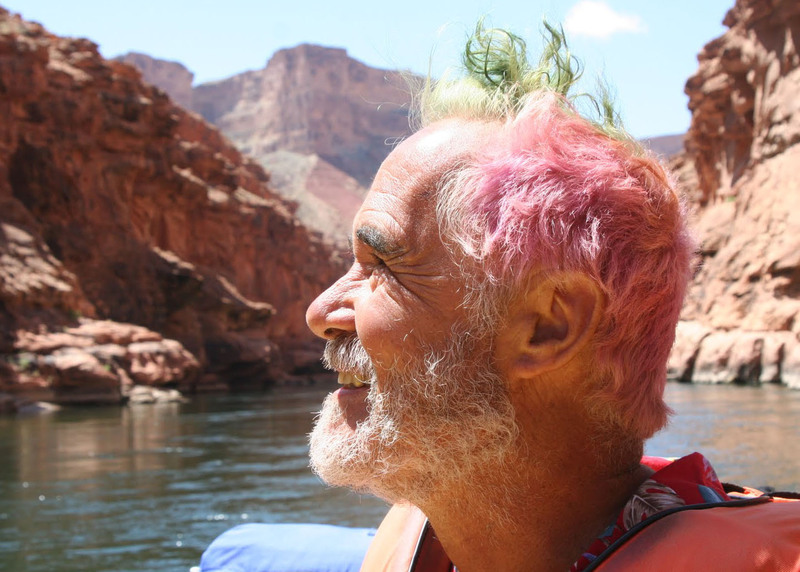 Preparation for our 18-day raft trip down the Colorado River through the Grand Canyon quickly taught me that eating was going to be a central part of our adventure. 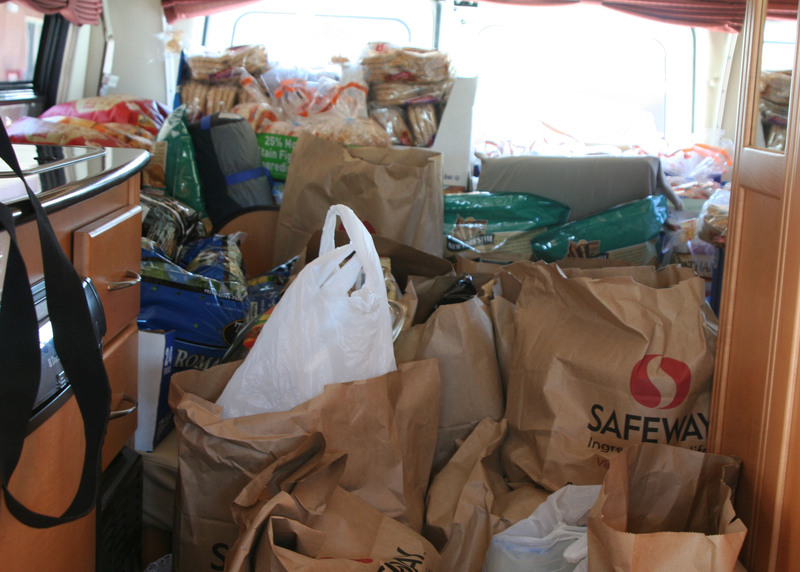 This is the back of my 22-foot travel van after a trip to Safeway in Flagstaff, Arizona. Great adventures start with the mundane. For example, did you cancel the paper? Common sense (and probably your mother) admonish that devious burglars have nothing better to do than to cruise the streets looking for rolled newspapers in front of your home. More importantly, what about the cat? Once upon a time Peggy and I had a cat named Effie. Vacations meant I would carefully measure out twice as much food and water as she could possibly eat or drink and four times the kitty litter she might use. The likelihood of her pooping all over the house was much greater that the likelihood of her starving. As a reward for my thoughtfulness, she would shed enough fur in our absence to fill a dump truck. Now we have food to worry about. Lots of it. Tom Lovering, the trip leader, his wife Beth and their friend Jamie Wilson arrived in Flagstaff three days in advance of our Colorado River trip. Their car was packed to the brim with empty ammo cans and other watertight boxes waiting to be filled with food and the miscellaneous paraphernalia of river trips. The Department of Homeland Security delayed their journey at Hoover Dam. The Agency is paranoid about mad bombers. Its normally low sense of humor dropped to zero when the agents saw all the ammo cans. The whole car had to be unpacked. 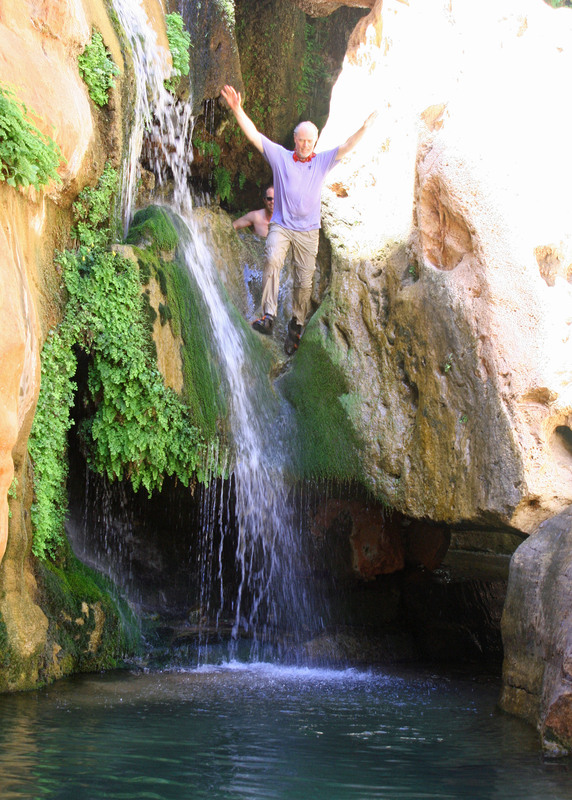 Tom Lovering, our trip leader, has been running rivers since the 70s. 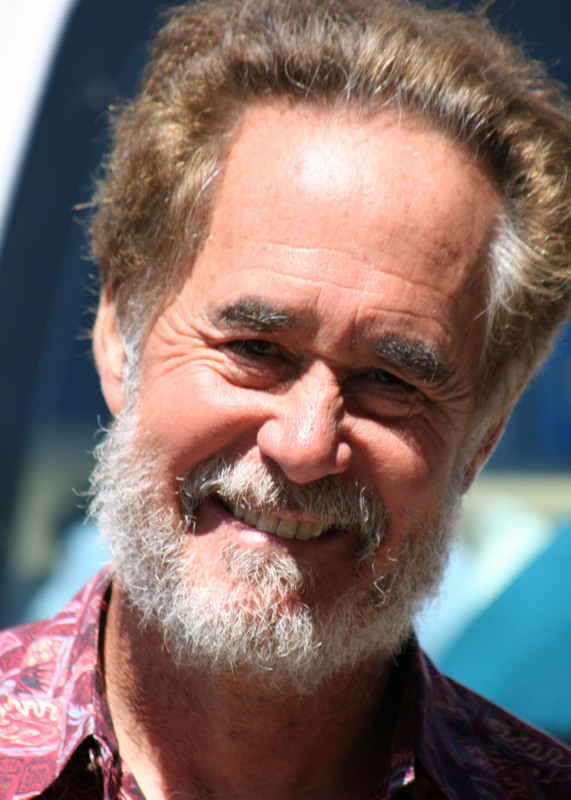 I first met him in 1974 when I persuaded him that his outdoor/wilderness store, Alpine West, should sponsor a hundred mile backpack trip I was organizing for the American Lung Association in Sacramento. Tom is even more paranoid about food than DHS is about terrorists. In addition to being a highly experienced rafter and trip leader, he’s an old restaurateur who had spent months planning the menu. Each dish has been tested several times and quantities have been measured down to the teaspoon. Recipes are spelled out in minute detail. We will eat gourmet on the trip… or die. The options are clear. Beth, Peggy and I are dispatched to Sam’s Club with marching orders. We fill seven large shopping carts with food. Think of it this way. There are 16 people going on an 18-day trip and eating three meals a day. This equals 864 individual meals. 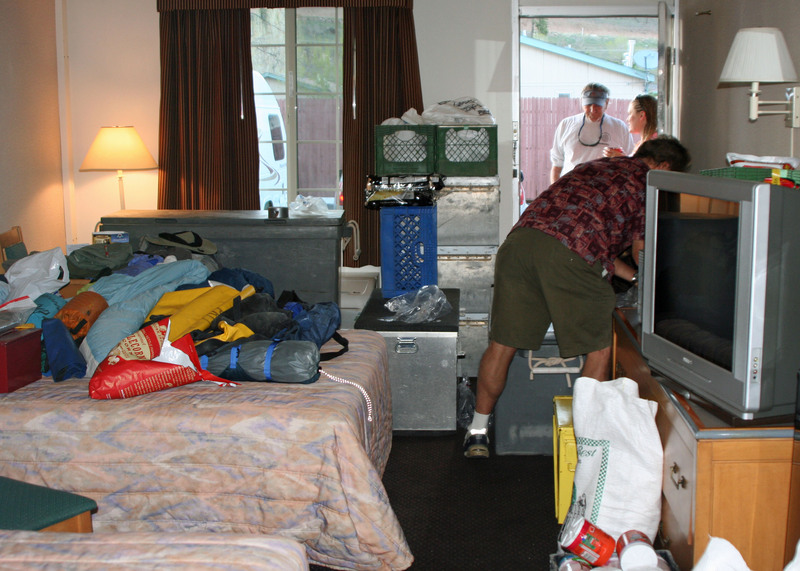 When we arrive back at the motel, Tom and Jamie have set up a staging area. Food needs to be organized by meal and day and then stuffed in the appropriate containers. The containers will then be assigned to rafts. It’s important that we know where to find the beer. We have yet to shop for perishables and more food is coming from Sacramento. Our room, we discover, is to be the recipient of most food. There is barely space to sleep. 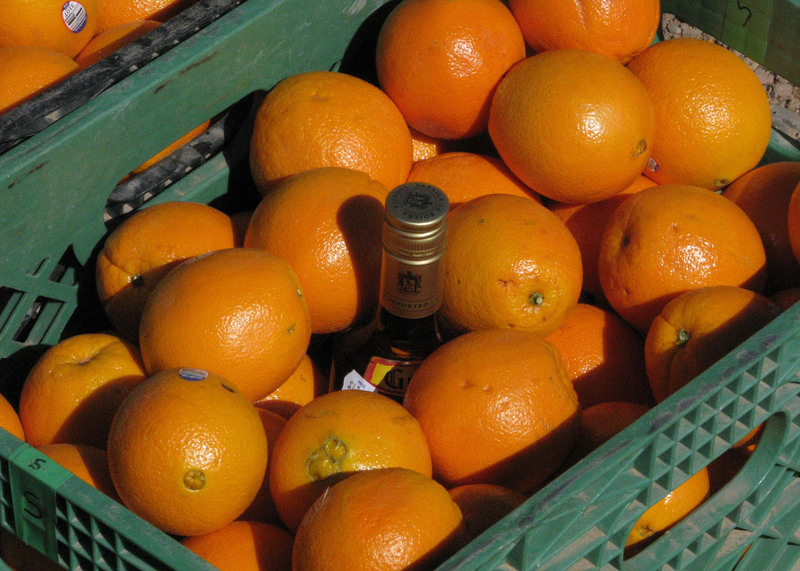 One of our participants obviously felt that tequila and oranges needed to be stored together. Our bedroom was packed with food. Personal gear is on the bed. 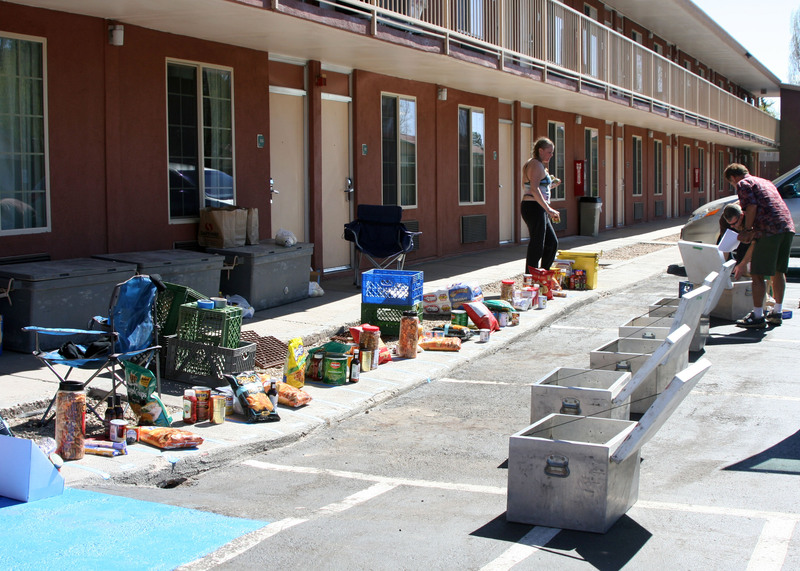 Food organization took place outside of our motel rooms. The next day is more relaxed. Other trip members begin to arrive and Peggy and I assume airport shuttle duty. Tom takes time for a makeover into something resembling an English Punk Rocker from the 70s with green and purple hair. Homeland Security was right to be suspicious. Tom is 50% businessman, 30% adventurer, and 20% character. Or maybe I have the percentages reversed. Here he is having his hair bleached for the trip. You will see the results in future posts. Next blog: Three days and 39 miles: The Journey Begins. The morning of the adventure has arrived. 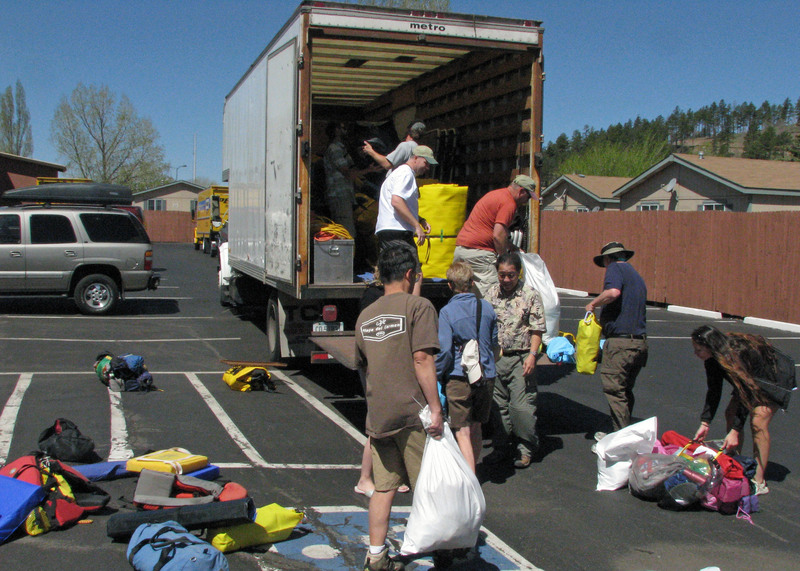 Everything we have packed… our food, personal gear and rafts are stuffed into this truck in preparation for our drive to the takeoff point, Lee’s Ferry. 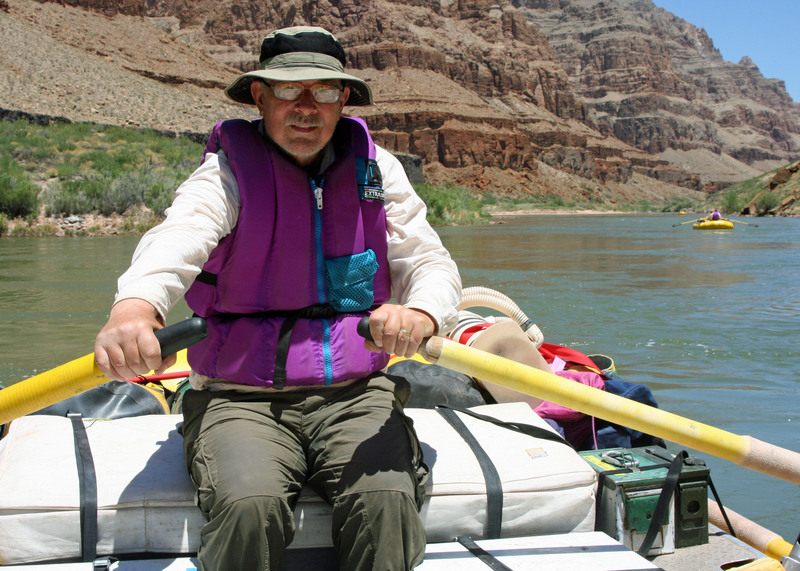 Today I begin my series on rafting the Colorado River through the Grand Canyon. Since it happened a couple of years ago, I am traveling back in time. 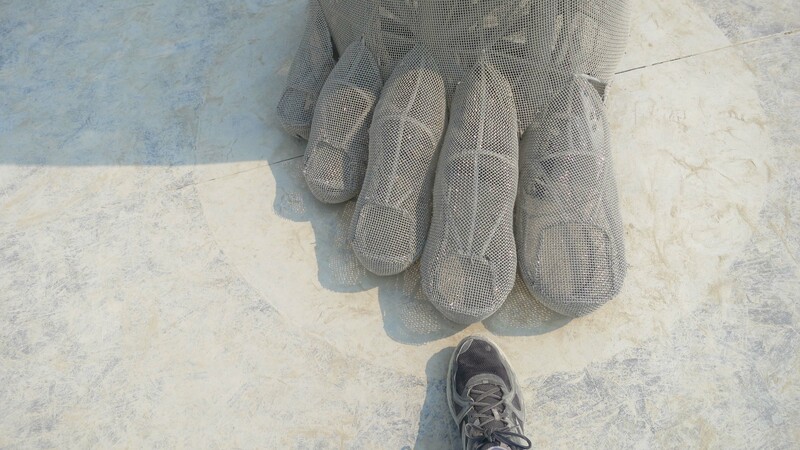 In fact I kicked off this blog with the trip, some 181 posts ago. This series will encompass more than my trip down the river, however. 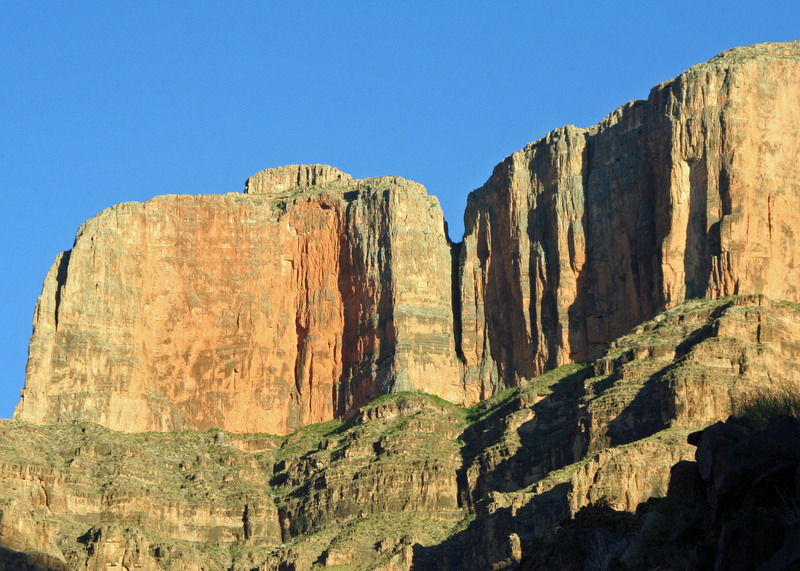 It is meant to be a celebration of the Grand Canyon, possibly the greatest natural wonder in the world. 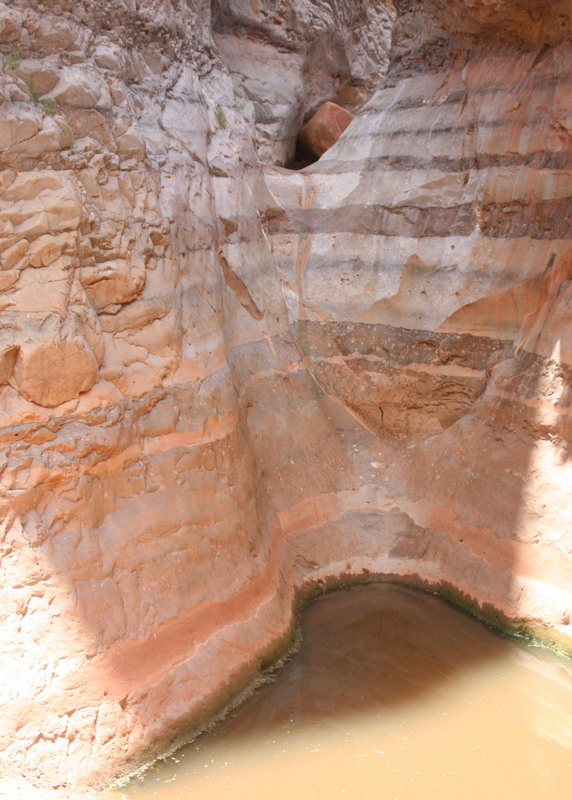 I have been back to the Canyon repeatedly in a time span that dates back over forty years. 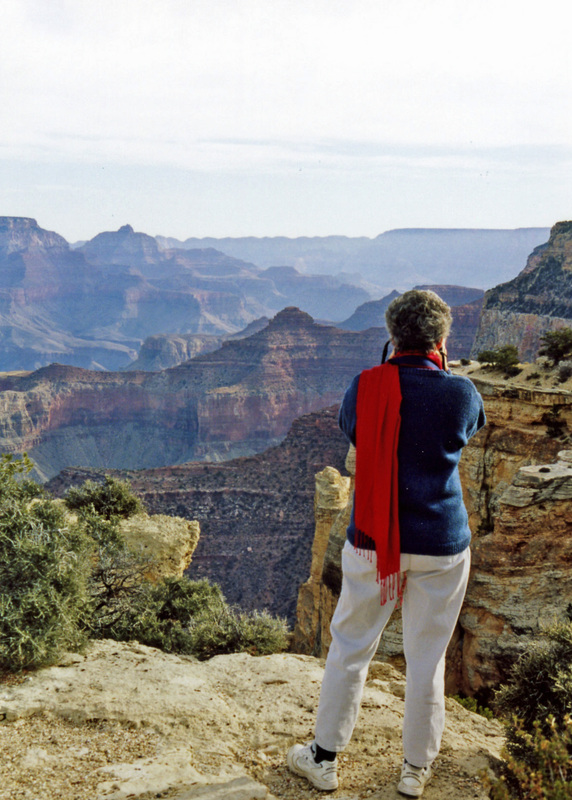 Peggy takes a photo looking down into the Grand Canyon. Three feet forward and she will have a thousand feet to learn to fly. I have wandered the South and North Rim, camped in all of the Rim campgrounds, and stayed at the magnificent El Tovar Hotel. Once I spent Christmas week at Bright Angel Lodge with a view overlooking the Canyon. I’ve been into the Canyon by mule, on foot and helicopter… as well as raft. 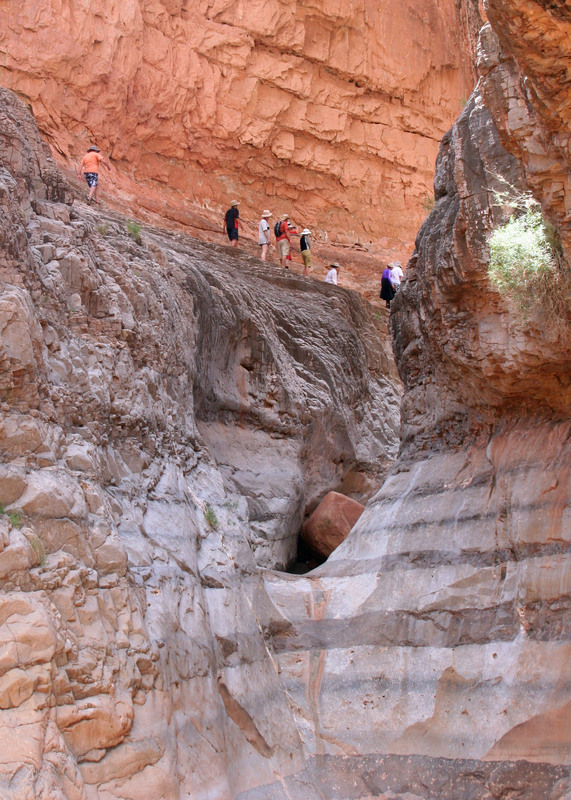 Several times I have explored the inner Canyon on weeklong backpack trips. I will feature one in this series. 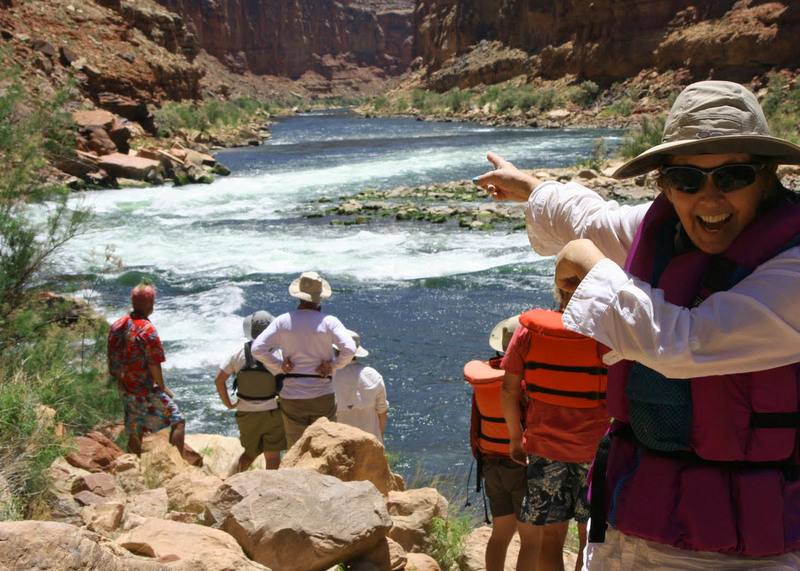 Our Grand Canyon river adventure started with a phone call. Tom Lovering left an urgent message. 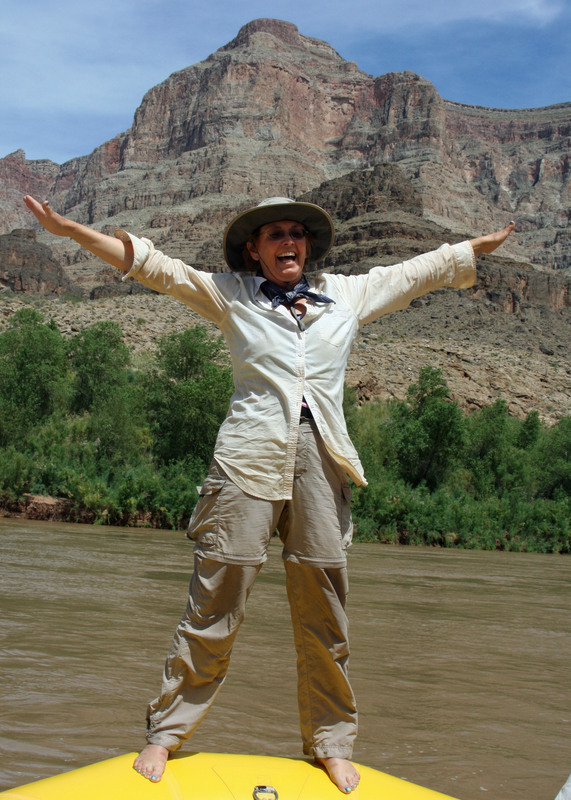 I had to immediately stop whatever I was doing (Peggy and my three-year road trip around North America) and climb on-line to sign up for the Grand Canyon Colorado River permit lottery. Apparently the permits are hard to obtain, somewhat harder than walking out of a casino with a million dollars. I am immune to Tom’s last minute schemes but the charming Peggy who loves water, loves rivers, and loves sunshine immediately jumped on-line and did the necessary clicking. Early the next morning we received an Email from the National Park Service saying we had won. It took me a lot longer to persuade Tom than it did for the NPS people to inform us. I am not, by nature, a white water man. I put running rapids right up there with dangling on rock cliffs, playing Kamikaze on ski slopes, and riding the latest death-defying roller coaster at Four Flags. My approach to outdoor adventure is more in the nature of planned risk taking than thrill seeking. 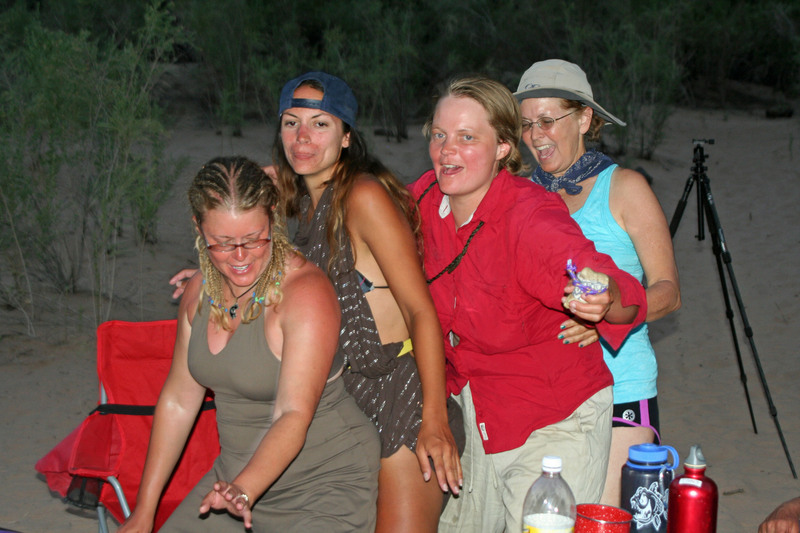 Consequently, I had only been on two real white water rafting trips. 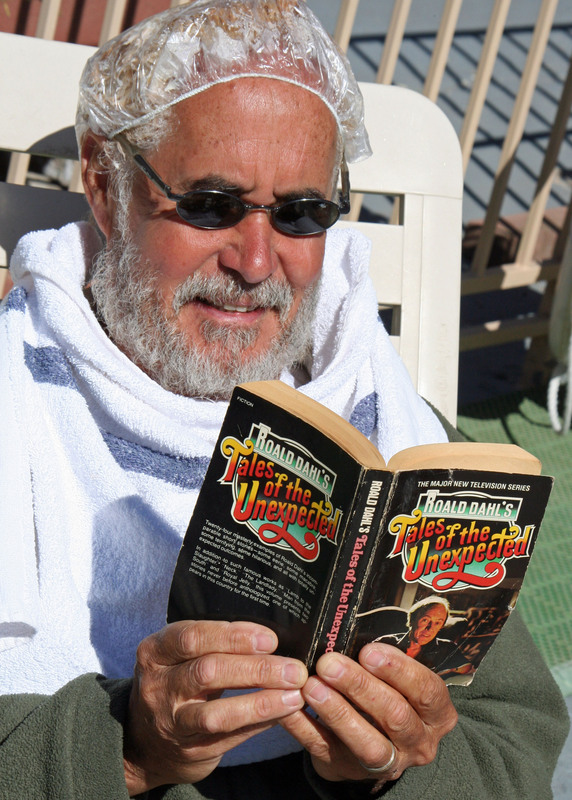 The first was with Tom on the Mokelumne River in California in the 70s. Within five minutes he had dumped us into something known as Dead Man’s Hole. “Paddle!” he screamed. 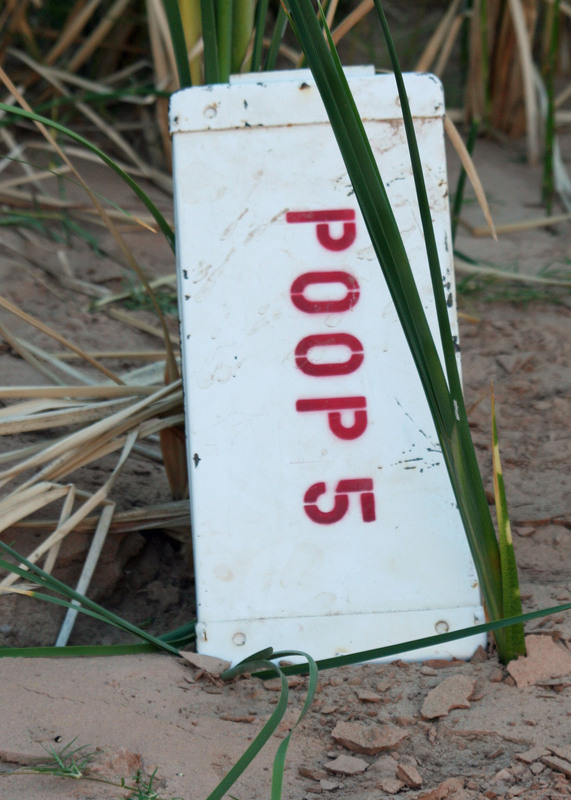 River rats love to give their favorite rapids scary names such as Satan’s Pool and Suicide Bend. 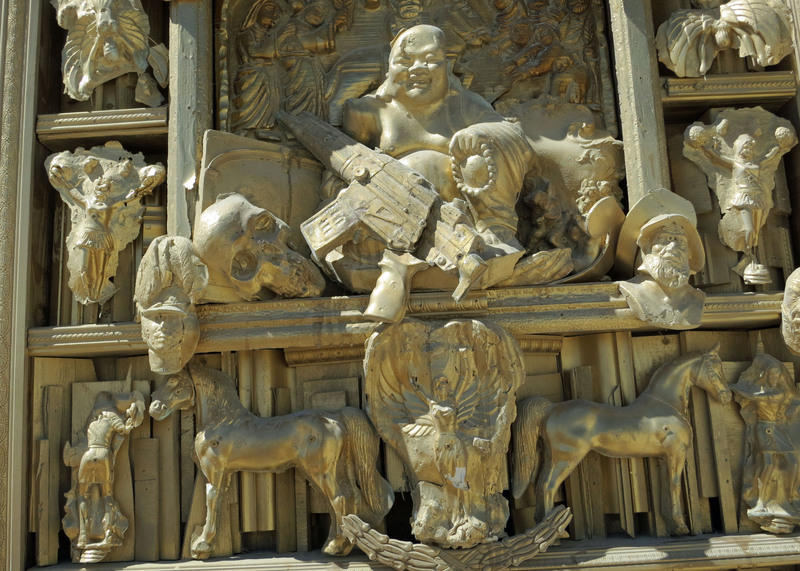 They can wax eloquently for hours over the qualities of these death-dealing anomalies. Our detour “was a learning experience,” Tom explained as we emptied the water out of the raft and lungs. “Next time you’ll paddle harder.” Yeah, yeah. My second white water trip was on the Middle Fork of the American River. This time I was travelling with Mark Dubois, his wife Sharon Negri and a friend, Bonnie Holmes. 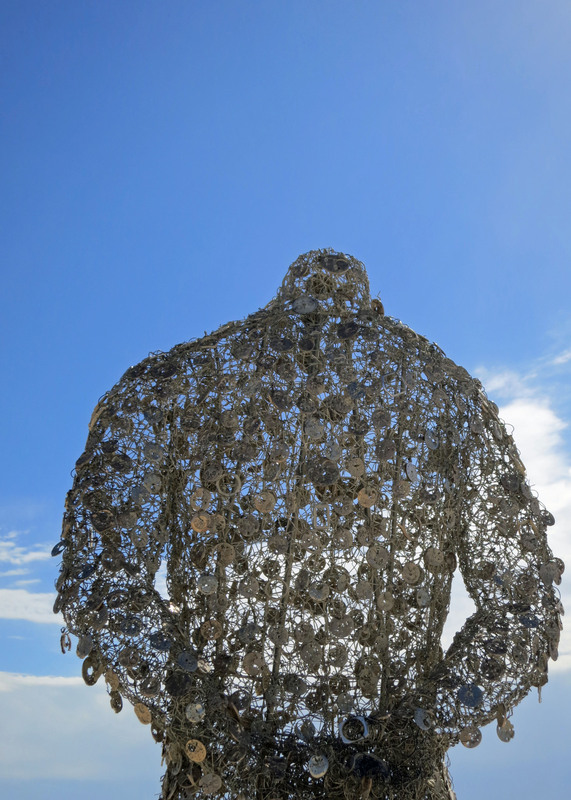 Mark, sometimes known as the Gentle Giant, once chained himself to a rock in the bottom of the Stanislaus River to stop the Army Corps of Engineers from flooding the canyon with water. He also co-founded Friends of the River, an organization dedicated to saving the wild rivers of the west. Our trip was rather mellow up until we came to a large rapid. Mark was having us do such things as close our eyes and lean backwards out of the raft with our hair touching the water so we could ‘listen’ to the river. He’s a spiritual type guy, one with nature. Apparently Nature had rejected me. And that’s how I classify our trip down the Colorado, a learning experience. But I know it will be more. 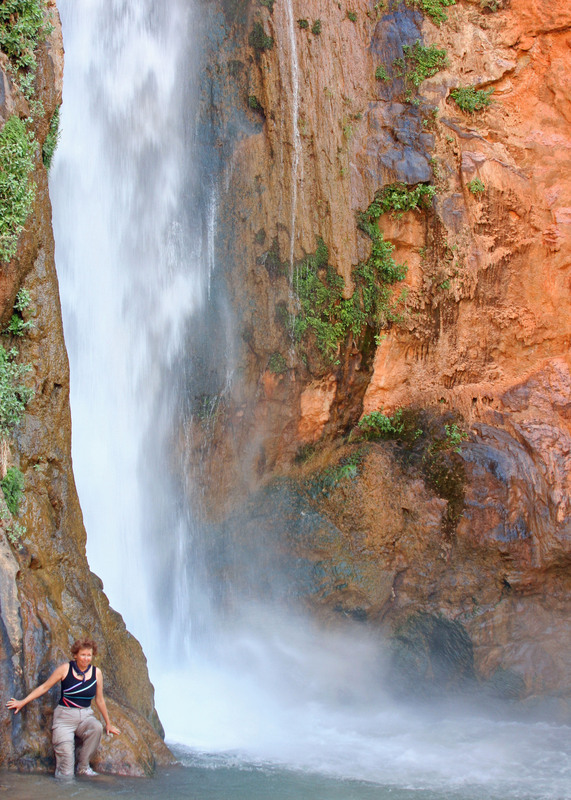 Every time I have visited the Grand Canyon over the years, I have come away with a feeling of awe and reverence. 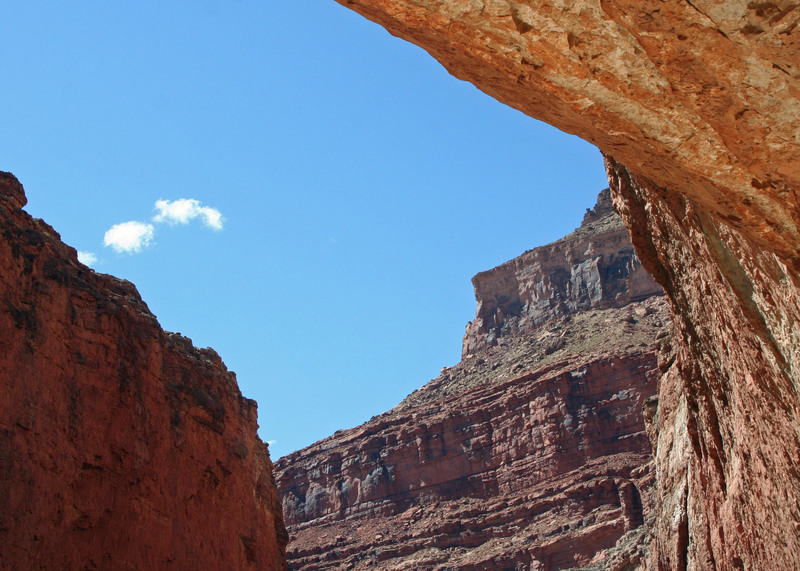 How could a trip through the Canyon’s inner core be any different? So please join my friends and me over the next few weeks. I think you’ll enjoy the ride. Here I am. They actually let me row. It had something to do with the lack of any nearby rapids. This is how Jamie, one of our experienced boatmen, handled that section of the river. Here are some of the folks that travelled with us on our 18 day trip down the Canyon. 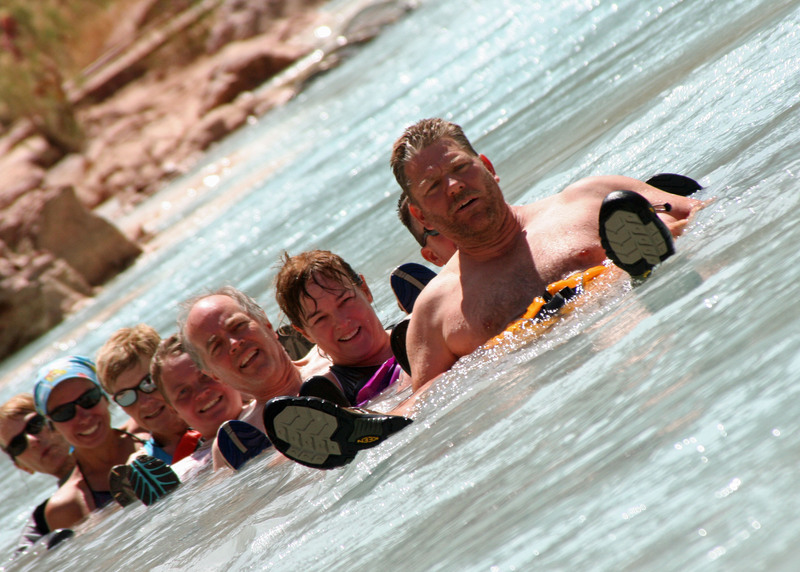 In this photo they have reversed their life preservers to look like giant diapers and are floating down the beautiful little Colorado River, one of many scenic stops along the way. They are about ten feet away from going over a waterfall. And our fearless leader Tom Lovering. 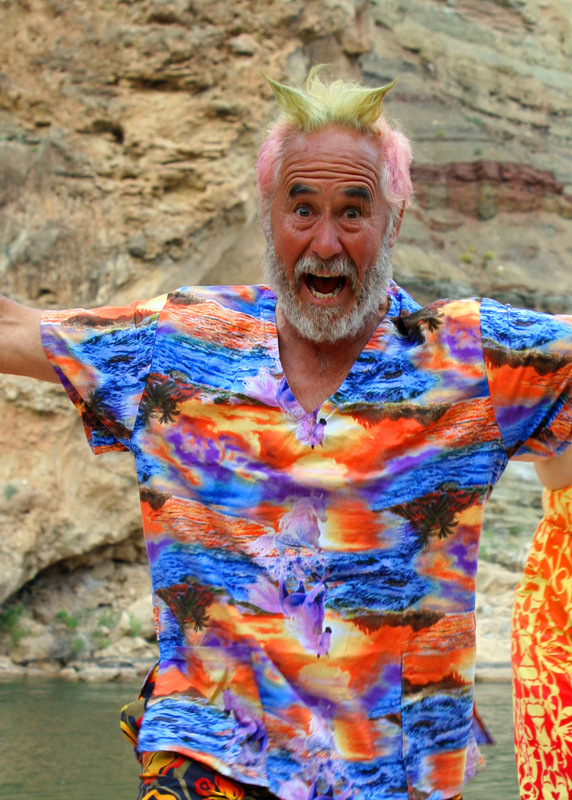 Are you brave enough to spend 21 days on the river with this man? 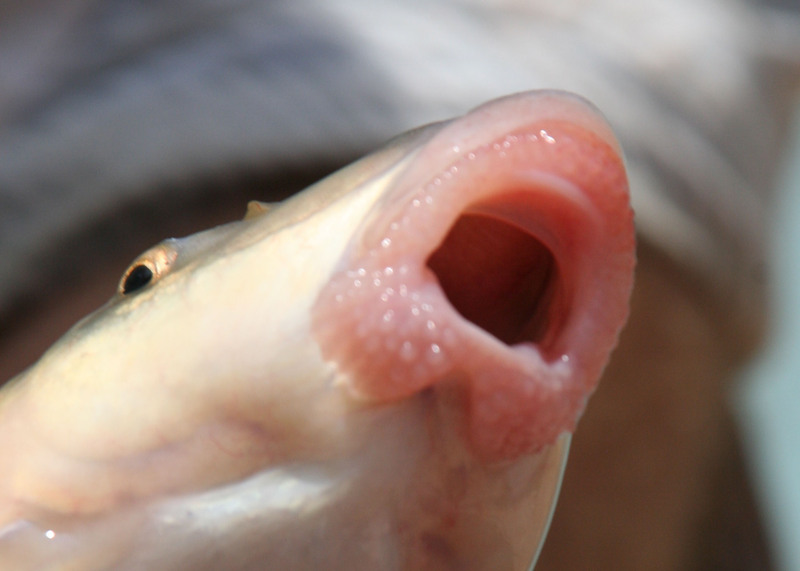 Even this Grand Canyon fish was amazed by our choice of leader. And leap from high places. Whimsical always wins me over. 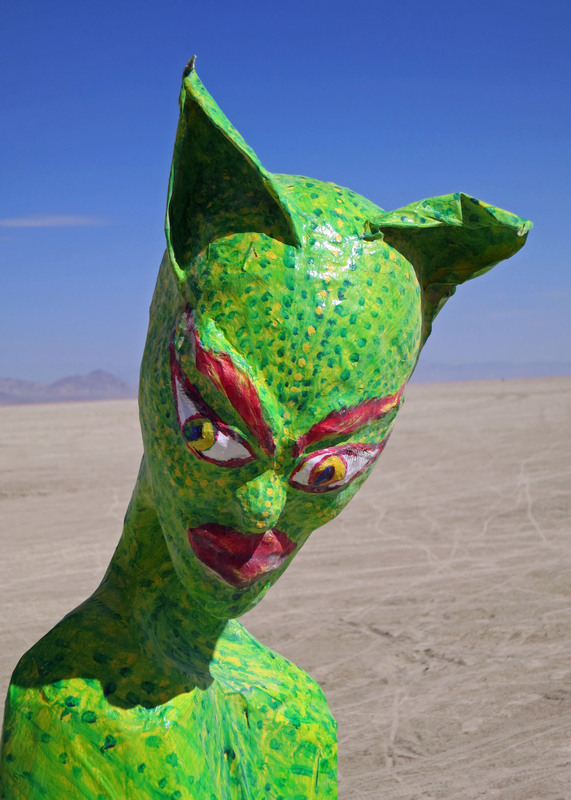 This is one cool cat… or is that cat woman. 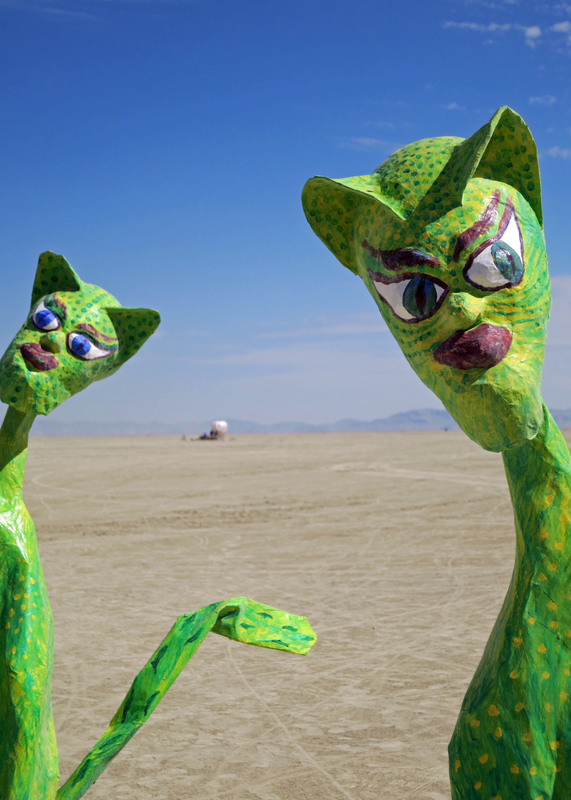 I had to travel far out on the Playa to find the cat sculptures. Face it; I am frustrated. 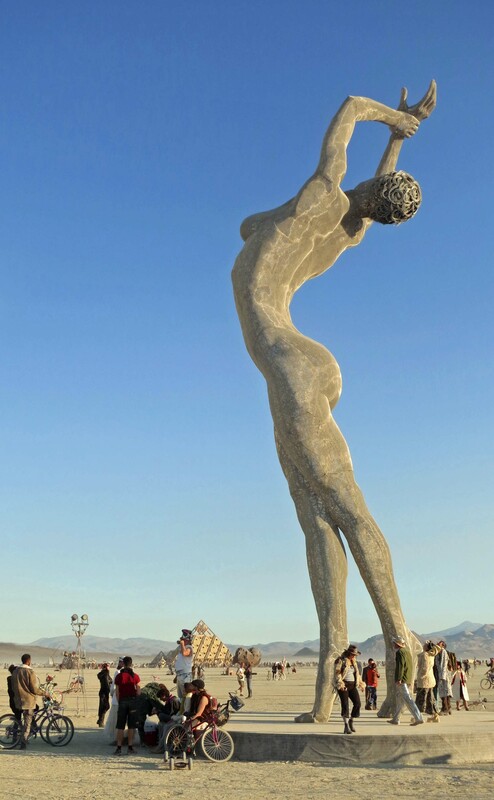 It is impossible to cover all of the art featured at Burning Man. 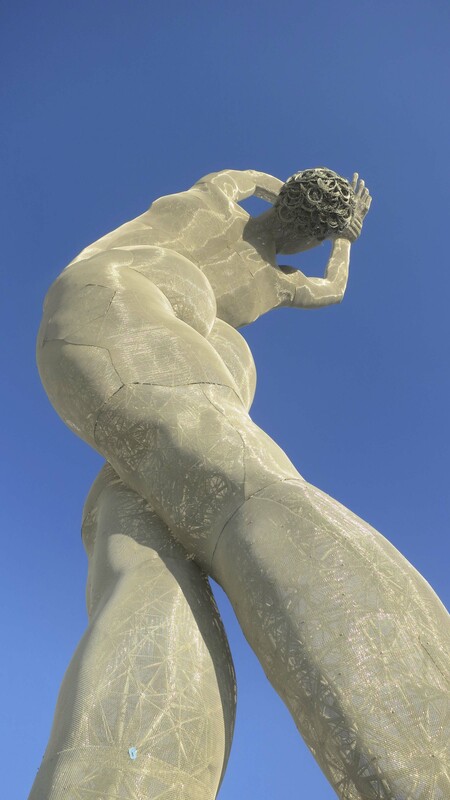 In fact with over 300 works of art scattered over the seven square miles that constitutes Black Rock City, it was impossible for me to even get around and admire each piece. 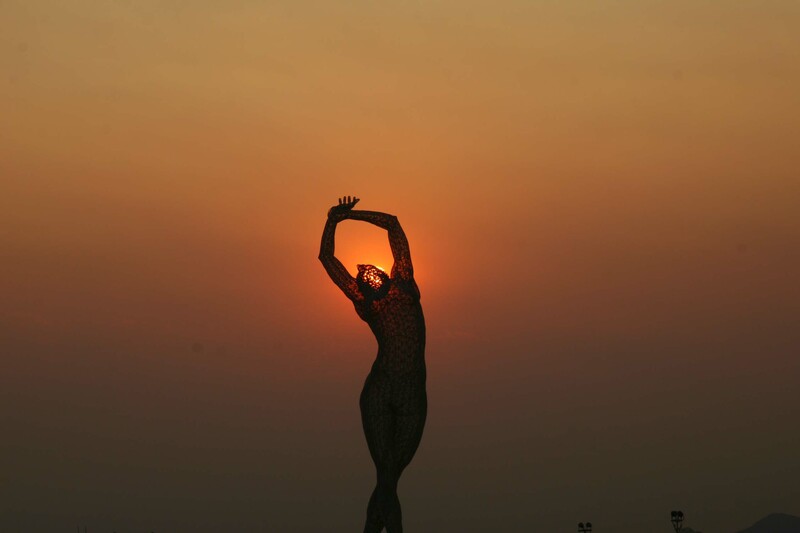 Maybe if I had devoted 24/7… but Burning man provides many distractions. 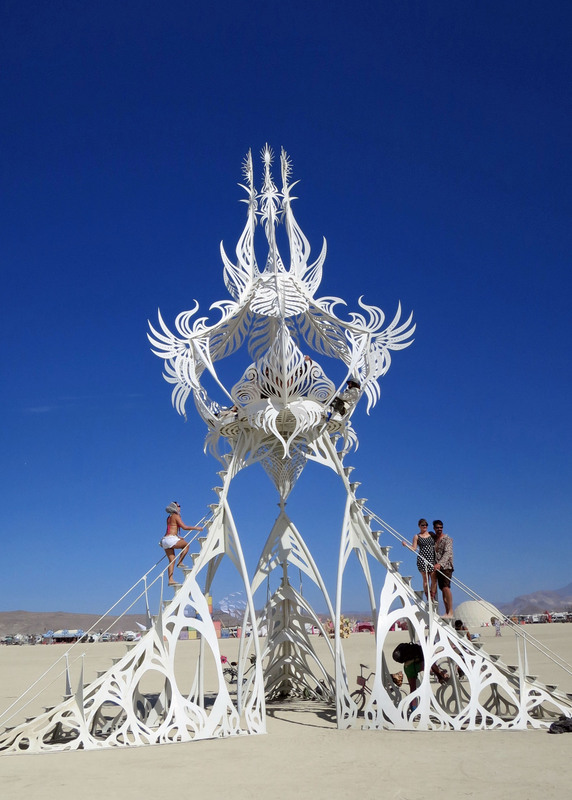 All I can offer is a tantalizing sample… and a recommendation: if you enjoy this art and you have never been to Burning Man, put the event on your schedule for the future. 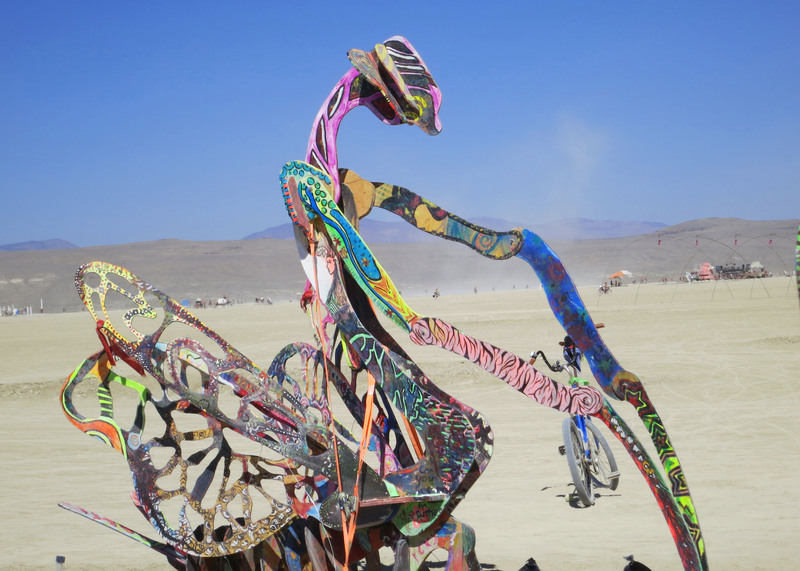 A final note before I jump into photographs: this year featured regional art from groups that are organizing local Burning Man activities from around the US and world. 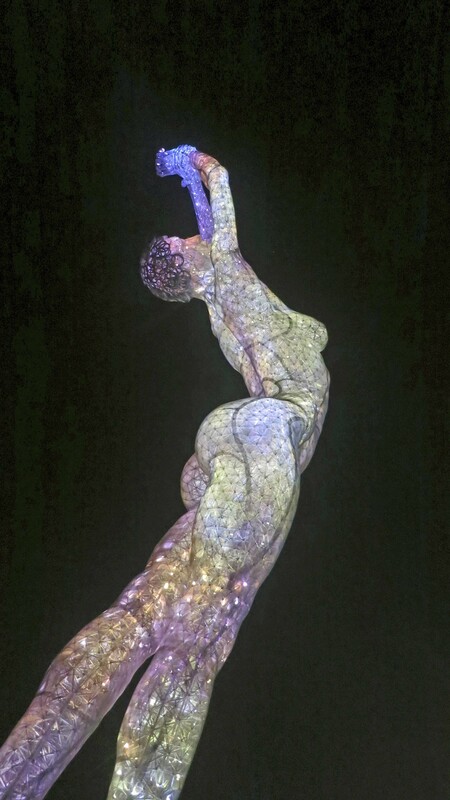 I will cover this art, and its fiery demise, in my next blog. 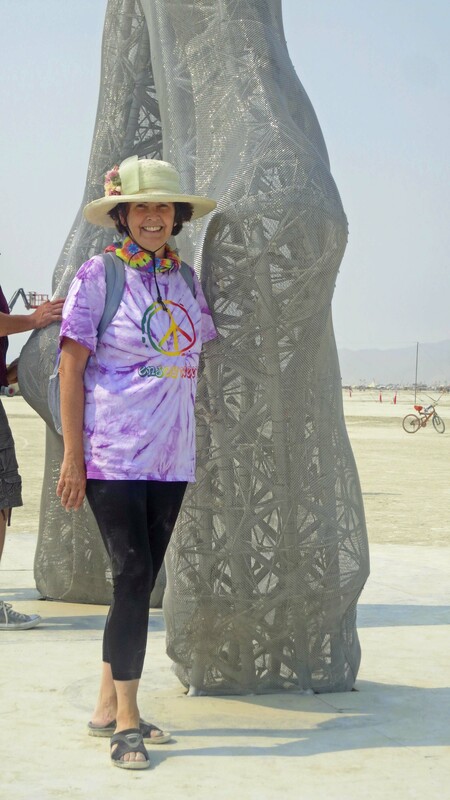 Another photo of the denizens of the outer Playa at Burning Man. One gets a sense of how far out they are by the lack of people in the background. 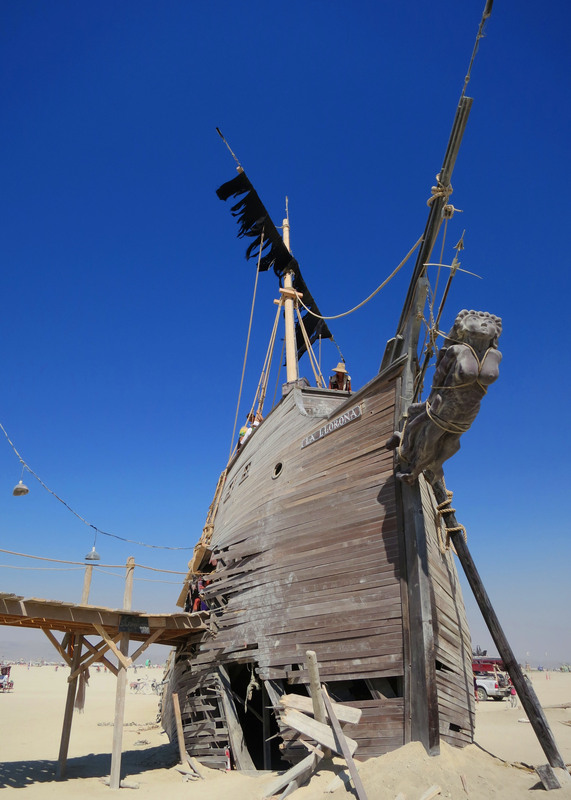 Imagine cycling across the desert and seeing in the distance a partially sunken 16th Century Spanish galleon. 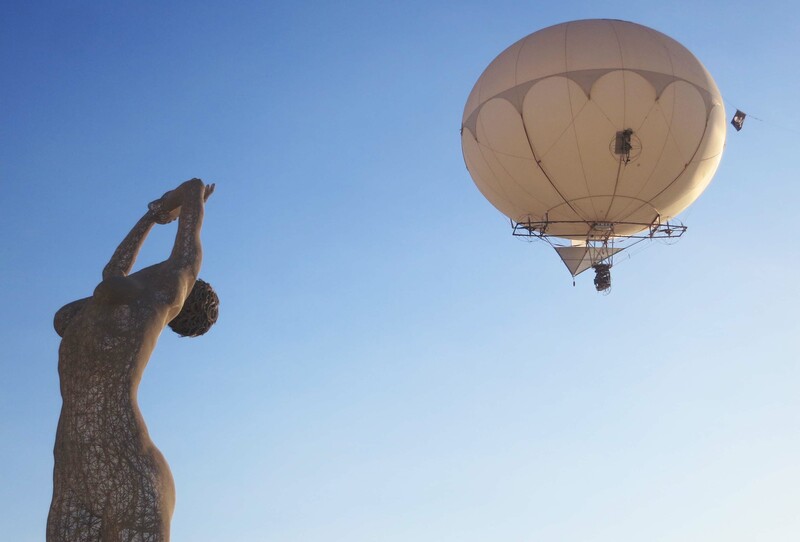 It’s almost unbelievable but at Burning Man you learn to expect the unusual. Artist Matthew Schultz headed up this project. What amazed me even more was the attention to detail, right down to the masthead. 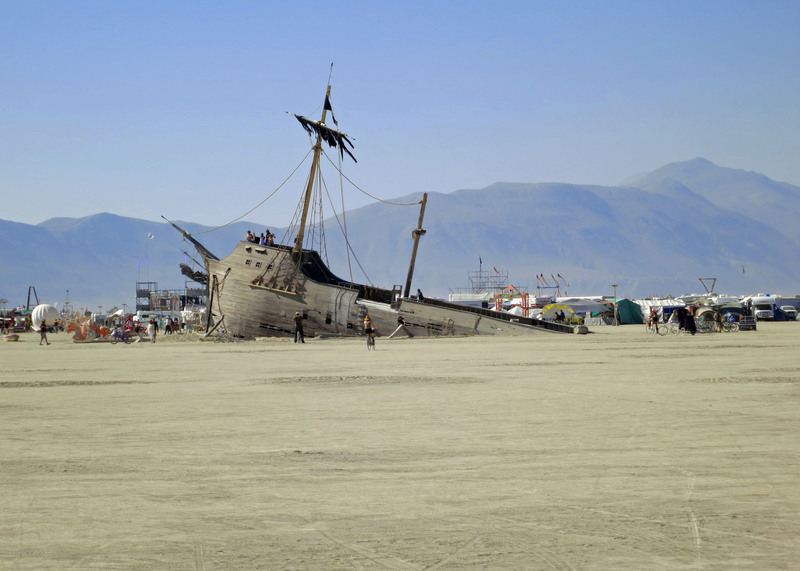 The story behind the sunken ship is that it crashed into the pier. 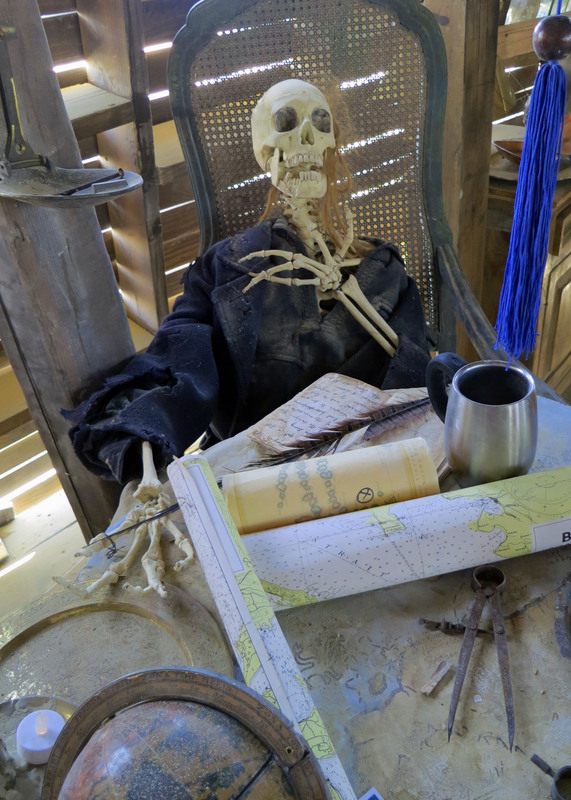 Further attention to detail, plus a sense of humor, was found below decks. Note the long fingers and the modern coffee cup. 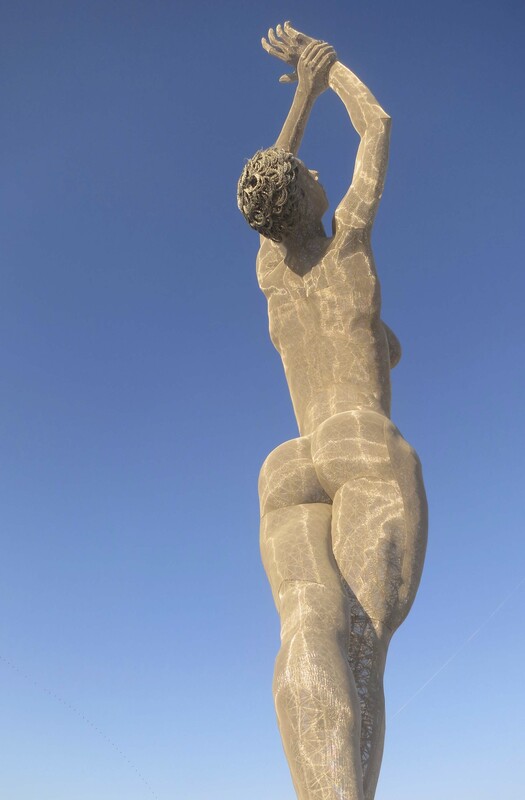 The pier, without the ship, was a very popular sculpture in 2011. 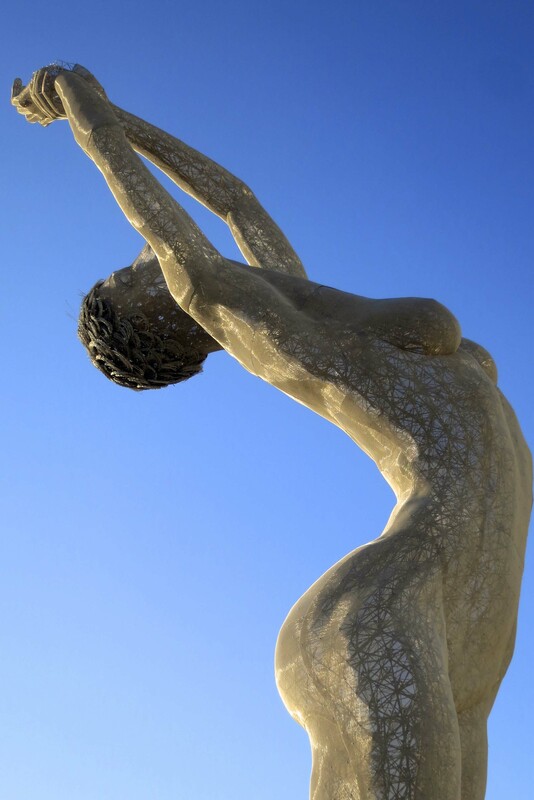 It is difficult to be an artist, or a writer… or even a blogger for that matter, without a little ego. This is a big one. 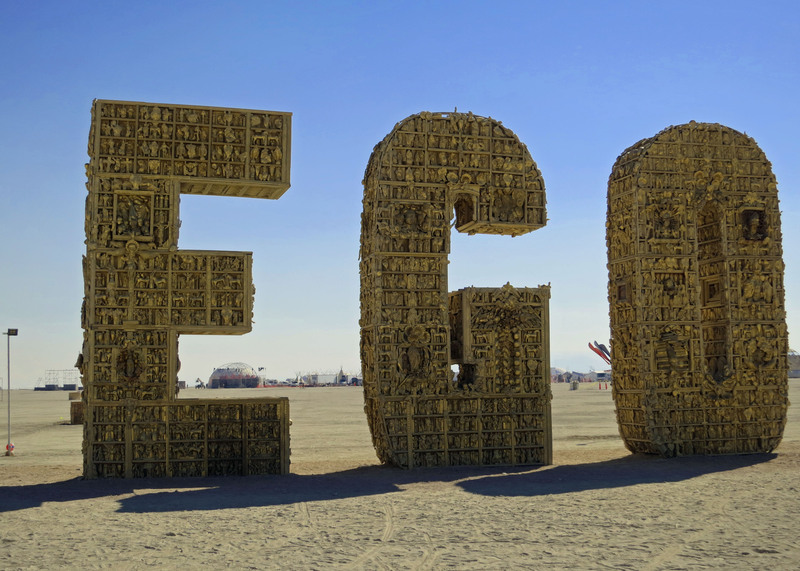 Since the artist, Laura Kimpton, and I are both somewhat dyslexic, I thought I would reverse the E.
Replicas of 10,000 trophies went into creating EGO. 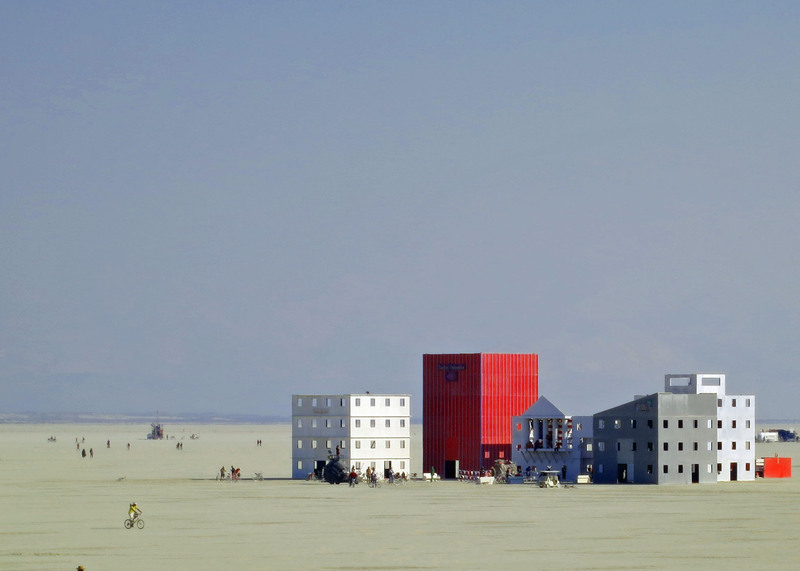 Wall Street, photographed here from the Man, was another major installation at Burning Man 2012. Otto Von Danger is the artist. Buildings were given such names as the Bank of UnAmerica and Chaos Manhattan. 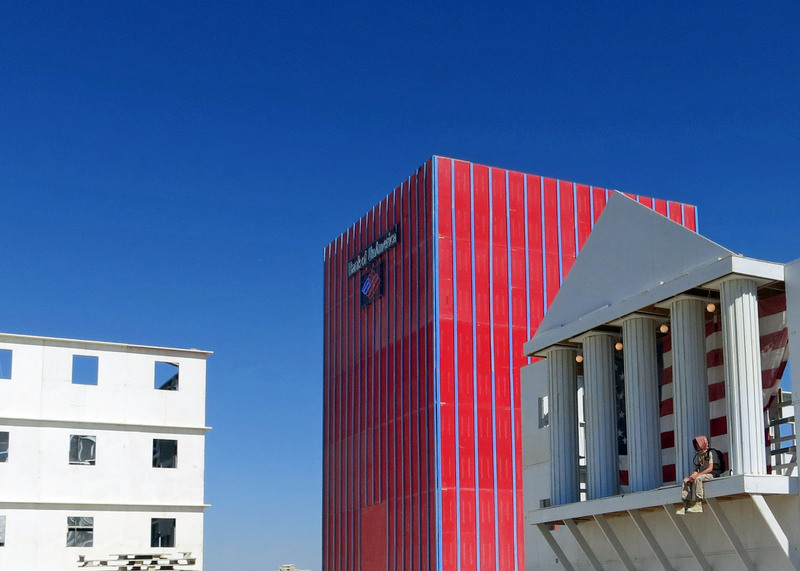 The Greek front is a replica of the NYSE. Like in many urban settings, graffiti was rampant. But we can all dream our financial institutions will become a little less greedy and a little more responsible. 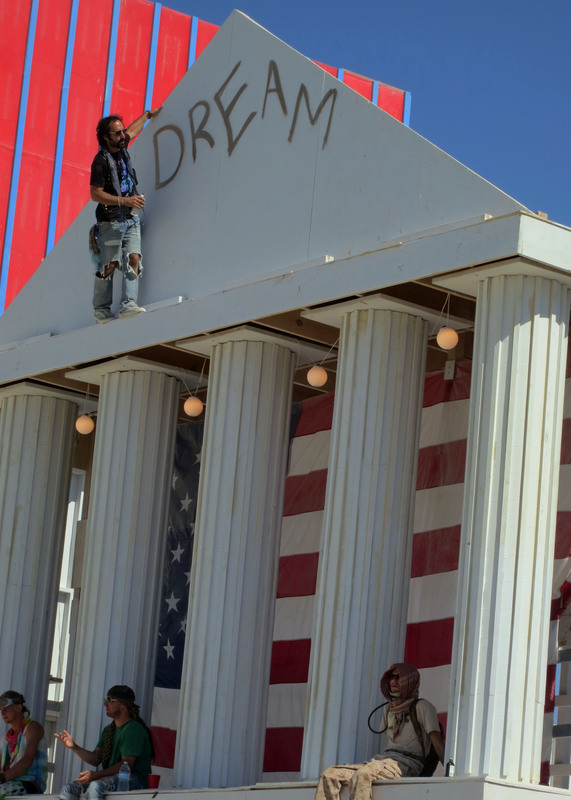 Wall Street was burned but not the American flag. 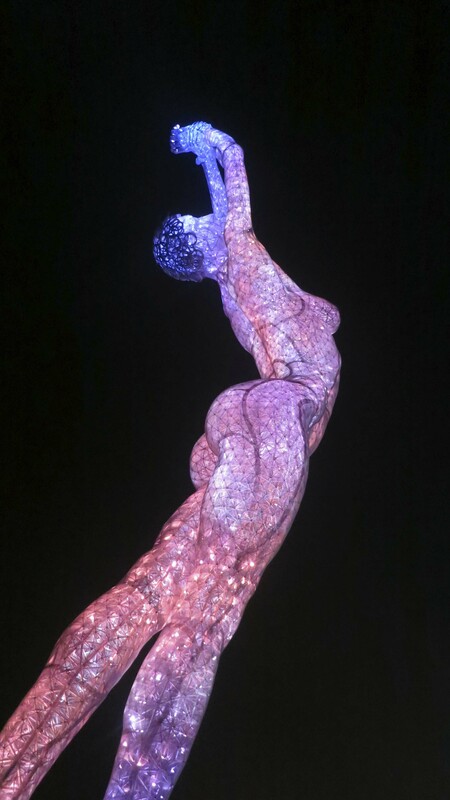 This sculpture by artist Kate Radenbush is called Star Seed. I thought of it as ‘fantasy arising from the dust.’ And why not. 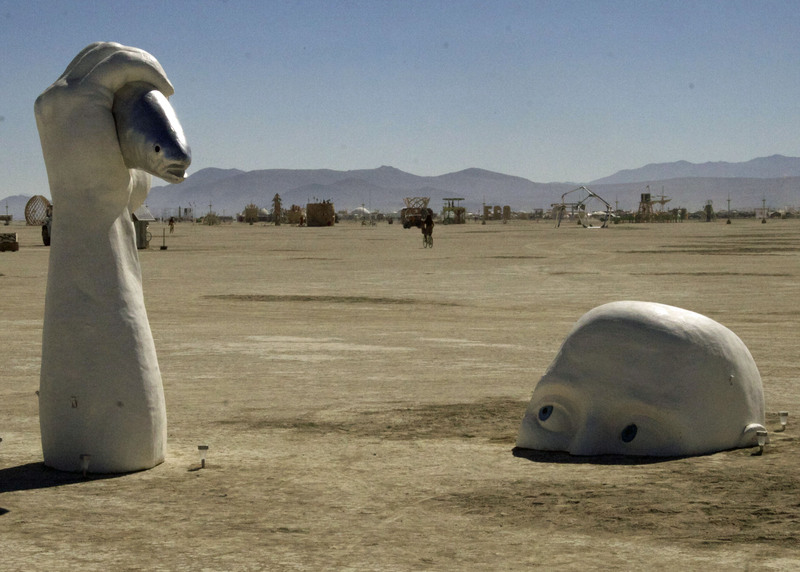 Participants are expected to put their own twist on Burning Man art. I did wonder whether we are seeding the stars or they are seeding us. If you look closely, you will note that this man’s skin is made completely of watch parts. 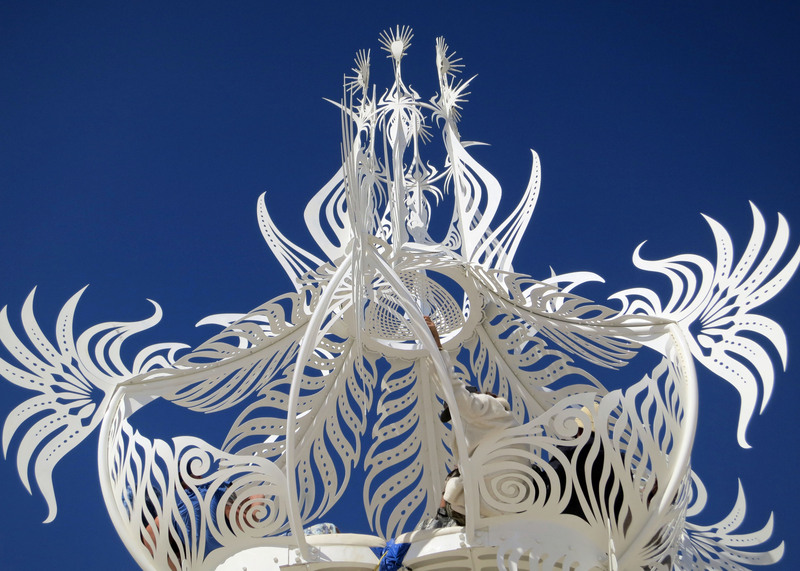 I also liked the see through quality as you look up at the sky over Black Rock City. 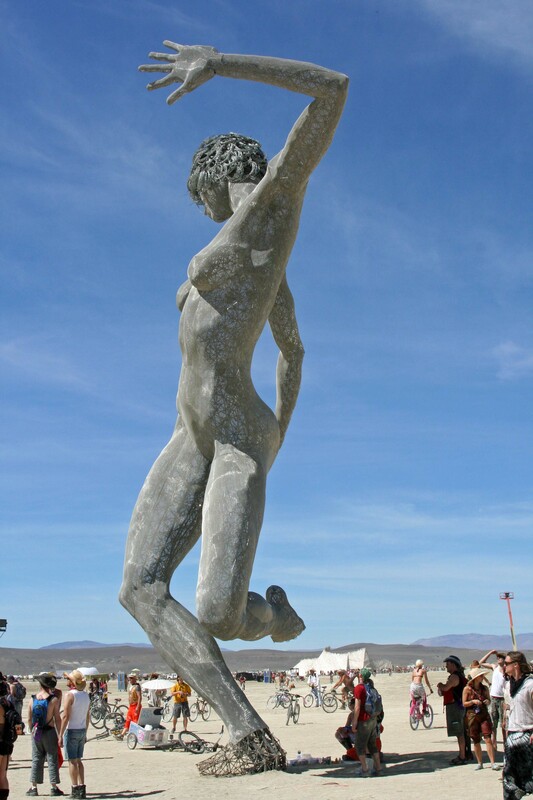 One sculpture featured a series of quotes. 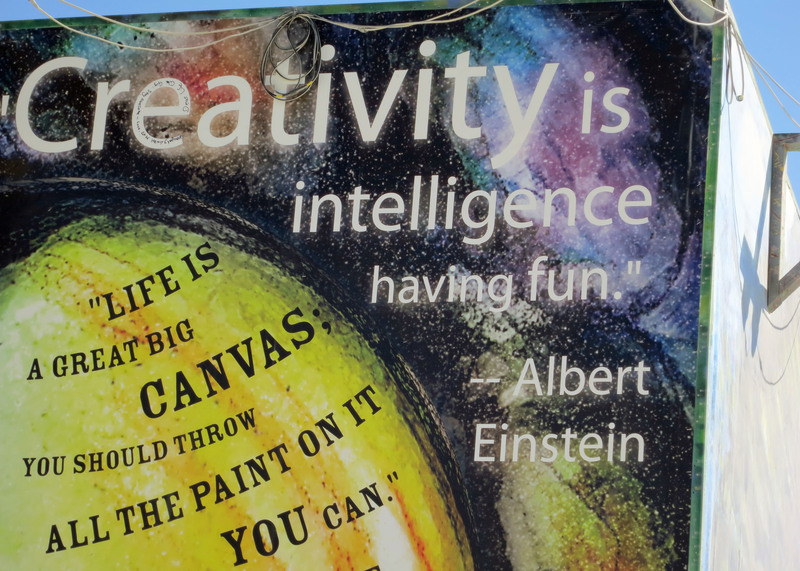 I found these two by Albert Einstein and Danny Kaye particularly appropriate for closing my blog on Burning Man 2012 art.